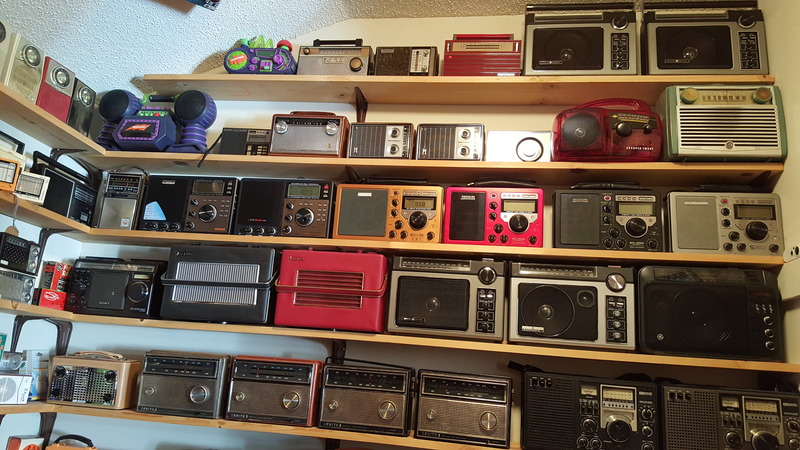 It’s a complex issue…considerably more complex than listing radios in order of Best to Worst. 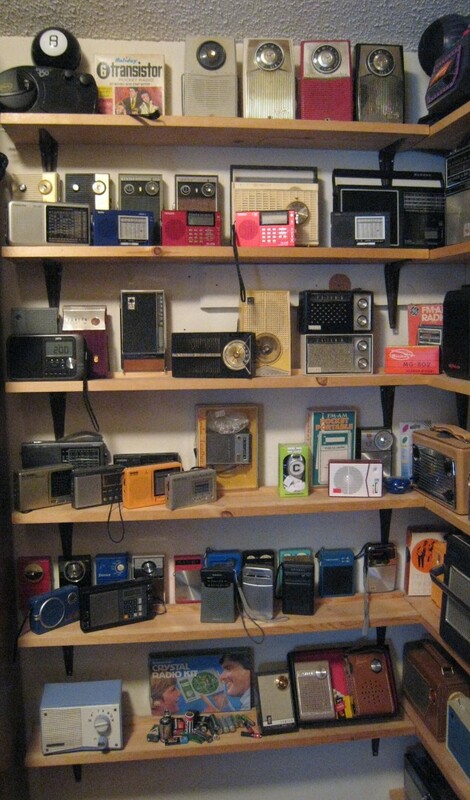 Radios have strengths and weaknesses, so one radio might be best in one situation and another might be best in another. So while I will assign these radios to groups, the Capsule Reviews following the lists will describe the radios’ personalities, along with their strengths and weaknesses to help you make a more informed choice. 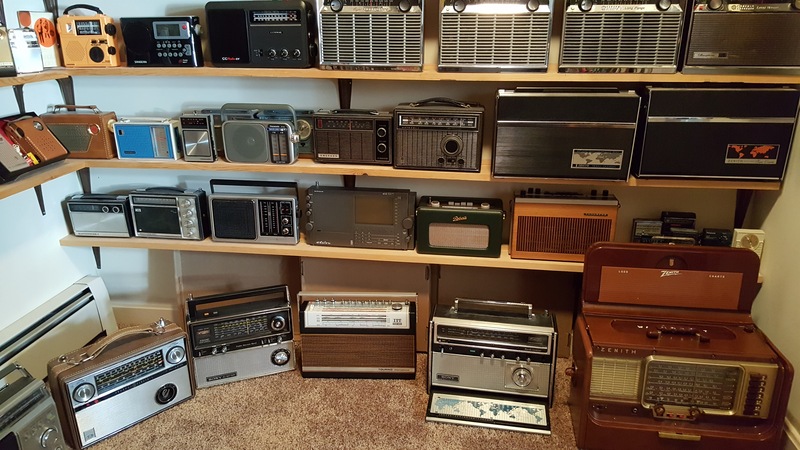 Remember, in this article I am rating these radios based first on their AM performance…I will note when a radio has other attributes or weaknesses such as excellent FM or SW and will also describe sound quality when appropriate. You can always email me to ask specific questions…I try to answer every email I receive. However please read the full reviews when available before emailing me as I receive many emails with questions which are clearly addressed in those reviews. Unit To Unit Variability: No two samples of a given model perform absolutely identically as received, especially vintage sets. Usually I completely rehabilitate the old radios I acquire, doing any repairs as needed to restore full, normal operation followed by a careful alignment to ensure the unit is operating at peak efficiency. I have been lucky enough to be able to examine multiple samples of many of the top models and have found that even after I have done everything possible some variations may still exist. When that happens I use a good, typical sample for these tests…an unusual sample either good or bad is obviously not the best candidate to judge a model in general. This seems to be the most reliable way to judge each radio’s inherent capabilities. This unit-to-unit variability is also a problem with many current models. How To Test AM Sensitivity: Although many factors affect reception and overall usability of a radio, sensitivity is without a doubt one of the most important variables in a portable AM set. Nevertheless it is amazing to me how few people seem to understand this relatively simple concept. The most reliable way to perform AM sensitivity tests is in the daytime when signals are weakest and most stable. It is also necessary to test radios in a very low noise environment…where Radio Frequency Interference (RFI) is not the limiting factor in reception. In a low noise location the radio’s own noise floor will determine how clearly a weak signal is received. Noise is generated in the radio’s own circuits and is heard as hiss behind the signal…a sensitive radio…one with a low noise floor, can make some signals sound more like strong locals while they seem more distant and hissy on other radios. The problem is that in today’s homes there are many noise sources, such as TV’s, high tech light bulbs, wired smoke detectors, computers, modems, garage door openers, cable boxes and some wall-wart AC power supplies/chargers to name just a few. Such noise is heard as a buzz or static which can obliterate weaker and in severe cases even strong signals. In such conditions you cannot determine the true noise floor of the radio…the interference becomes the limiting factor in your AM reception, masking the differences in various radios. See my article Combatting AM & SW Interference at the top of the Home Page for tips on how to deal with noise and improve your listening experience. Another major point – When comparing radios it is important to use as many frequencies as possible because I often find that a particular radio may do unusually well or poorly on one or two stations…using only a few frequencies can yield very misleading results. Tedious though it is, the more signals checked, the clearer the picture becomes so I log and tabulate the results. Quieting Curve: Although Quieting Curves have long been specified with regards to FM tuners this term is almost unheard of in AM radio tests, yet differences in this quality can make a huge difference to the program listener, especially daytime listening. Two radios may receive very faint signals similarly, but as the signal strength increases, one radio may achieve a better signal to noise ratio (less circuit hiss) far sooner than the other. This radio will generally be more pleasant to listen to because most signals you would actually be able to listen to will be less noisy on it. Yet the two might be considered by some to have equal sensitivity. This is one area in which I find many AM radio comparisons to be lacking. 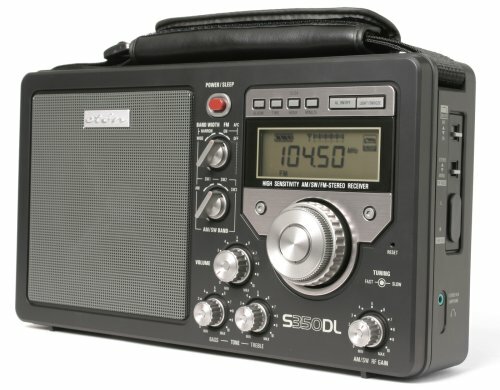 While so-called hard-core DXers value a radio’s ability to pick faint traces of audio out of the mud, most program listeners listen to somewhat stronger signals, and for these stations, a radio with a better quieting curve will sound much nicer than another which is hissier on such signals. To test for this I use many different signals of varying strengths, up and down the dial and note how the radios compare…after a while clear trends emerge. Selectivity: Selectivity is the ability of a radio to separate signals that are close to each other on the dial. Most better radios will separate adjacent signals, (say 610 versus 620 KHz) with no problem unless the desired signal is much weaker than the interfering signal. Since the ferrite rod antennas used in almost all portable AM radios are directional this can be aided by careful aiming if the signals are arriving from different directions. One of the big advances made possible by Digital Signal Processing (DSP) is the inclusion of up to 5 bandwidths even in inexpensive AM radios…this was impossible just a few years ago. You use wider bandwidths when there is no interference for best clarity or crispness, and use narrower bandwidths when you need to block out an interfering signal right next to the one you want to listen to. Overload/RF Dynamic Range: While good weak signal sensitivity is desirable, another important factor is immunity to strong signal overload. If you live near an AM transmitter site you may find that a strong local signal spreads out on the dial wider than it normally would, or even pops up at other points on the dial, covering up stations you should otherwise be able to receive. If you live in a metropolitan area with many strong signals, a radio which is susceptible to overload will not be fun to use. Multiple mega-strength signals can mix and splatter spurious images all over the dial. Another form of overload is called desensitization…a loss of sensitivity to weak signals in the presence of stronger ones even if they are not immediately adjacent on the dial. My suburban testing location does not reveal much about overload performance, however I do regularly travel to strong signal locations to see how various radios perform there and I will note this in the comments. How well a radio handles both strong and weak signals is referred to as RF Dynamic range…a radio with a wide dynamic range will be very sensitive to weak signals yet still resist overload on strong ones. Since it is more costly to design a radio with a good dynamic range, many portables are skewed one way or the other; that is, they may be sensitive to weak signals yet overload easily, or they may resist overload well but not be so good at hearing weak signals. The best designs will do both…generally they are the older analog designs, using a Tuned RF Stage which is an additional gain stage at the RF input. 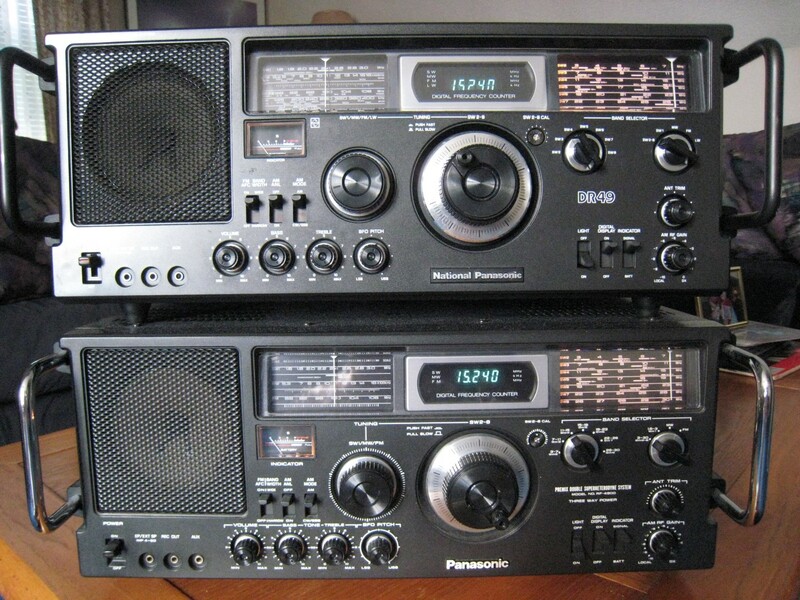 Vintage radios such as the Panasonic RF-2200 and the GE SR I and SR II are notable examples of extremely sensitive radios that can also handle strong signls with aplomb…the GE SR (aka the SR I) and SRII are good bets to find in good condition and at a reasonable price on eBay. (Far Left) Mostly vintage AM-only portables from the 50’s & 60’s. AGC (Automatic Gain Control) : All of these radios have AGC which increases gain as signals get weaker – the goal is to keep volume levels as constant as possible with varying signal strengths. Without AGC weak signals would be as quiet as a whisper while strong signals would knock you over. Some radios do a better job at maintaining constant volume than others. There are other characteristics of AGC, such as the time constants of its attack and release, which can affect how well the radio handles those varying, “quivering” kinds of signals you encounter at dawn, twilight and at night but that is beyond the scope of this article. For our purposes I’ll simply note how well the radios maintain decent volume on weaker signals. Soft Muting: A new problem in some of today’s radios which use Digital Signal Processing (DSP) is soft muting. It is designed to reduce noise between signals…a sort of rudimentary noise reducer. Unfortunately it is a poor concept and in fact, works counter to AGC discussed above. Radios with aggressive soft muting are unpleasant to listen to because they are subject to pumping…unnatural surging of volume as signals rise and fall. Soft muting also reduces the volume if you need to slightly off-tune for best reception. The latest batch of DSP radios have much reduced or non-existent soft muting…that is a step in the right direction. Audio Quality: Although this is a reception report first and foremost I will comment on sound quality where appropriate. A program listener may prefer a radio that hides noise a bit while the “Hard-Core” DXer may prefer a radio which gives maximum intelligibility to extremely faint traces of signals. Also a radio with very extended or pronounced high frequency audio response will accentuate noise more than a radio with a mellower tonal quality or less extended high end; there are areas of subjectivity here but the radios can also be objectively quantified so you will know what to expect. The best of both worlds is a radio with some user control over the tonal characteristics. Features & Ergonomics: Older radios were analog with simple tuning dials and controls. Most (but not all) current radios are digital, and the tuned frequency is locked in perfectly and displayed digitally. 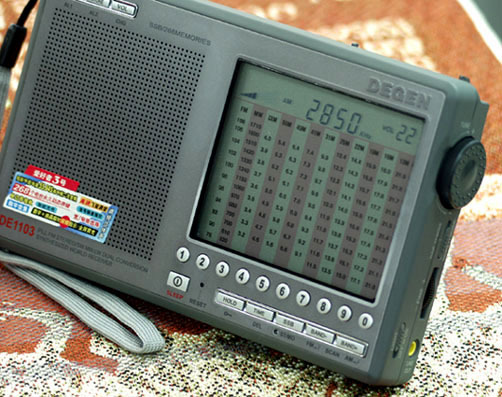 Most digital radios have many features, such as direct frequency entry via a keypad, clocks, timers, many memory presets, auto scanning and more. Either type of radio can perform well or poorly…it depends on how well it is designed. There are good reasons to prefer either…I tend to use both types for different jobs. I enjoy band scanning on my old analog radios but I also use digitals to hop from one frequency to another quickly. There is no best choice. Please remember that these radios are rated within groups only…they are not in descending order within the groups except as noted. 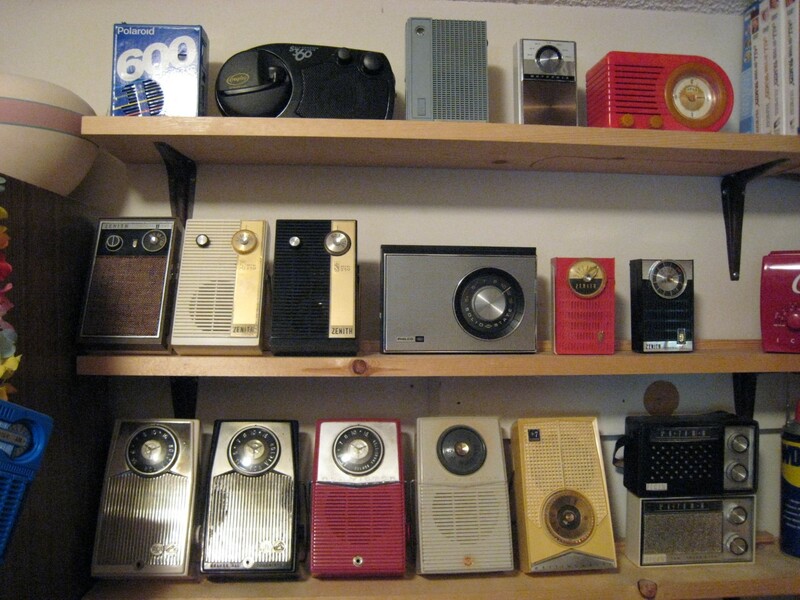 I will occasionally comment when a radio is near the top or bottom of its group – also note that most of these radios have full reviews on this site…a few will be upcoming. I also welcome your comments and questions at radiojayallen@gmail.com…those with general interest will be posted in the Q and A column under the Reader’s Questions Tab. The Contestants (In Groups Rated For Overall AM Reception– Models Within Groups Approximately Equal Except As Noted) – Capsule Reviews follow the lists. Five star radios provide AM reception as good as it gets in a portable radio…these days you usually get excellent FM reception as well. They will pull in weak and medium strength signals with an absolute minimum of background noise and let you hear any signal that is receivable in a given location. But remember – if noise limits your reception, an excellent radio may do little or no better than a poor radio. For more information on improving your AM reception see my article Combating AM and SW Interference. Within groups radios are approximately equal overall except as noted, but may have different strengths and weaknesses described in the capsule reports that follow the listings…most of these have full reviews as well…there will be links to them in the capsule reports. 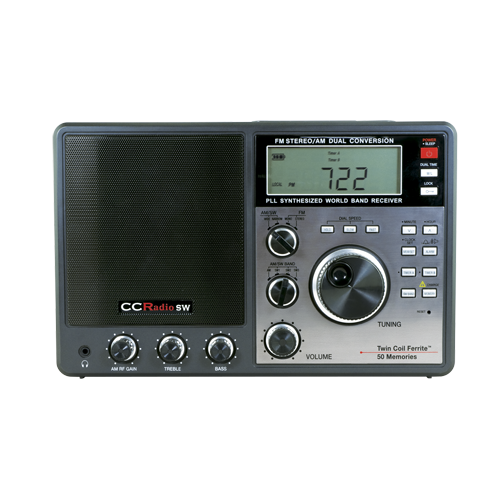 CC Radio-2E***** Solid radio with full range audio and top tier AM/FM reception except for some soft muting. CC Radio-2 ***** Bandwidth-limited audio but lack of soft muting is a plus for DXers. 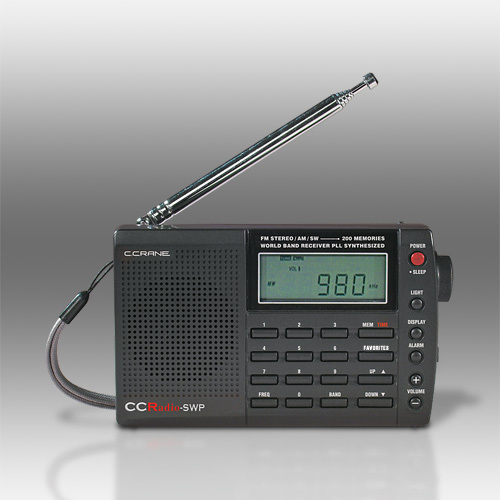 CC Radio-EP ***** Full analog feel and top tier AM reception – average FM reception and full audio – great bang for the buck. GE SR I/SR II *****Strong AM reception and decent FM, good sound. Not quite as selective on FM as modern DSP portables. Grundig Satellit 205/Transistor 5000***** Huge, heavy, German-engineered, mellow European audio, top tier AM and sensitive SW.
Nordmende Globe Traveler***** Nice sound and top AM reception, decent SW too. 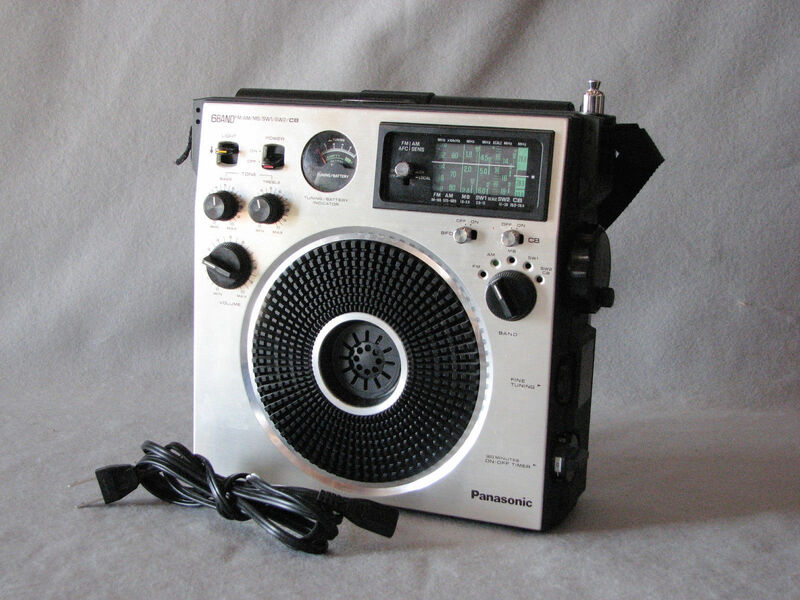 Panasonic RF-2200 ***** Still My Reference AM Portable – no portable has beat it but some have come close. Also excellent FM. Still excellent, Four and 1/2 Star radios are very close to the top radios except for very slightly more background hiss on weak to medium strength signals and sometimes a bit less selectivity. But you won’t hear the difference between these and the best radios unless your local noise floor is low. In many if not most settings these radios will therefore perform just as well as the very best radios. They may also have other features or qualities that make them very desirable in many circumstances. 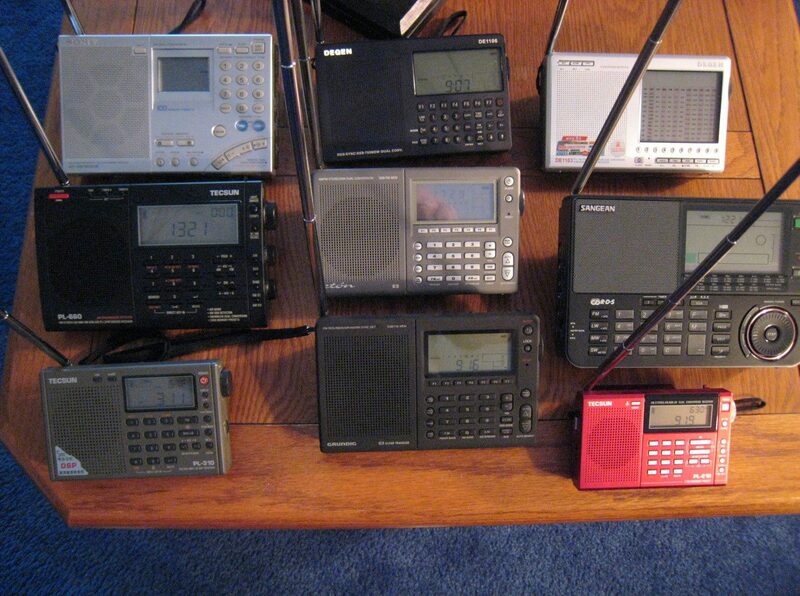 I consider the Four 1/2 Star and Four Star radios to be truly excellent AM portables. 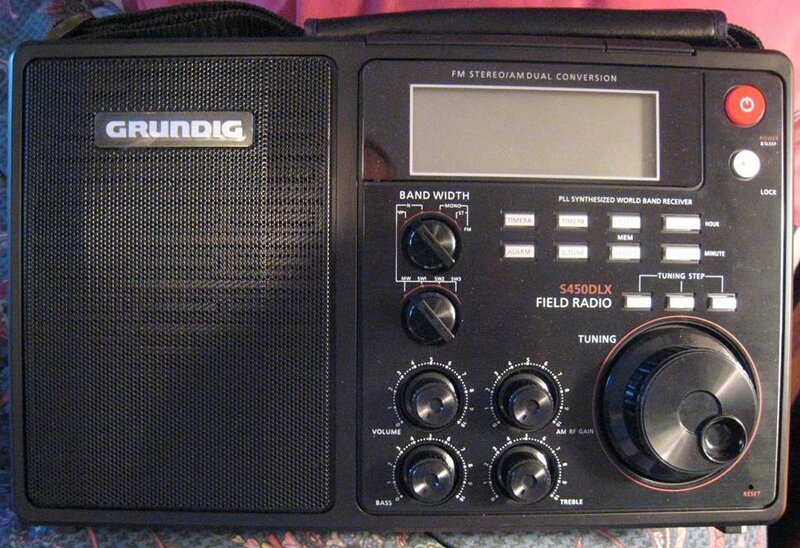 Grundig Satellit 208/210/Transistor 6000/6001****1/2 Best SW ever in a portable and a great analog bandspread dial. 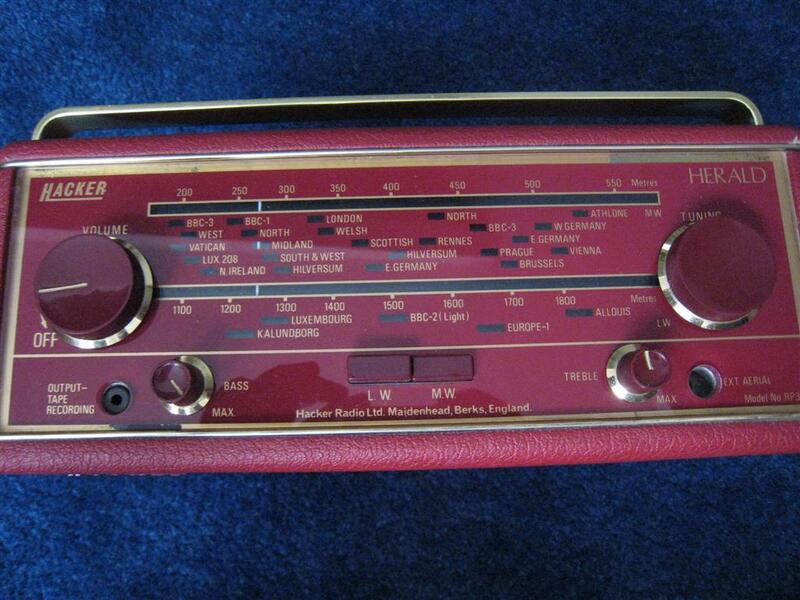 Hacker Sovereign RP-25/Herald RP-35/**** 1/2 A very British radio – simple internal design but performs very well. Sangean PR-D4W****1/2 An unusually good value & somewhat better sound than the PR-D5/D15 models. 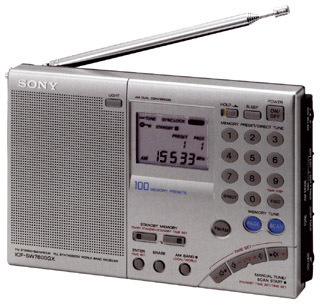 Sony ICF-6800W ****1/2 A hair noisier on medium strength signals than the ***** radios above but very sensitive to the faintest traces of signals this is a solid AM performer and its SW is among the best of any radio tested. Average FM selectivity. Sony ICF-EX5MK2 **** 1/2 A hair less sensitive then the five-star radios but super selective. Many reviewers have raved about this radio saying it is super sensitive and the best there is but after checking several samples I find it is quite sensitive but a touch hissier and not as good as the radios above. However, its uniquely designed homodyne synchronous detection places it among the most selective portables I’ve ever tested. Eton E1**** (Because it uses a whip antenna rather than a ferrite rod for AM it performs less well when there is local noise which can render it nearly useless…in low nose areas its AM is very good. See capsule and full reports for more. 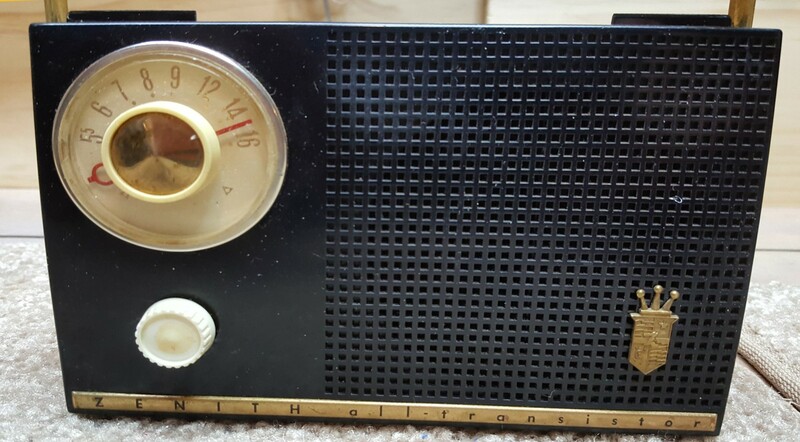 GE P-780/783/784 Series**** GE’s 1958 tour de force design demonstrated how good transistor portables could be – a great radio! ITT-101/102/103**** Most powerful sounding audio anywhere near this size and super AM selectivity. Good FM. 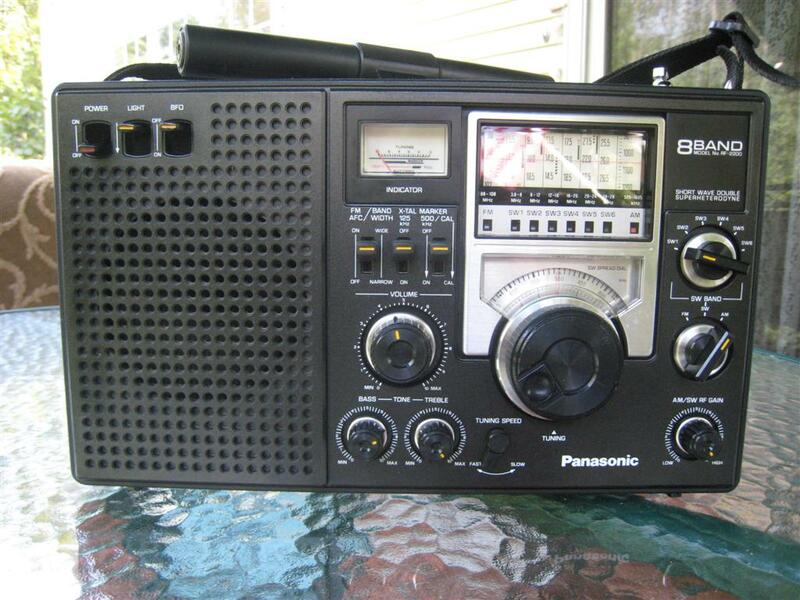 Panasonic RF-4900/DR-49**** A tank of a radio doesn’t match the RF-2200’s AM but beats it on SW. Good FM. Sony ICF-2010**** An all-time classic still beats all current production portables on SW – FM average. 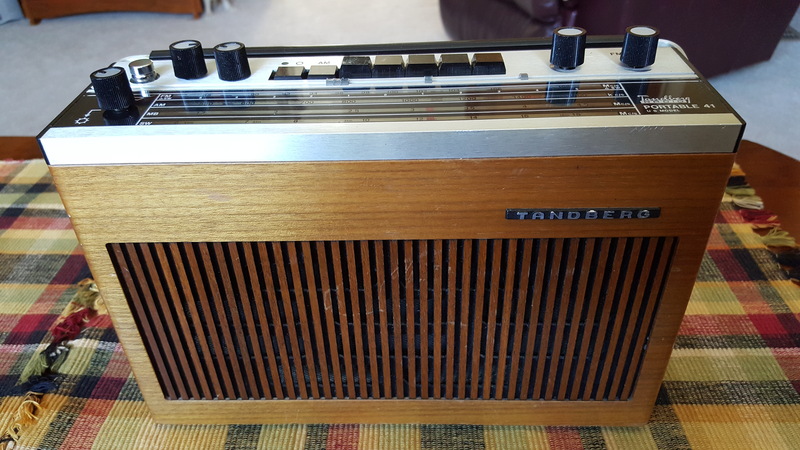 Tandberg Portable 41/Model 41**** Uniquely European design – a beautiful-looking radio with powerful audio and good reception. Zenith Royal 755M/74/ 755-LF-LG-LK **** Zenith’s best performing lunchbox size AM series of portables. Zenith Royal 760 Navigator/780 Navigator/790/97M Super Navigator **** Slightly less sensitive AM than the 755 Zeniths above. Grundig Satellit 800 ***1/2 Critics aside the large Satellit 800 is a good performer even with its built-in antennas, although it really sings with an external antenna which it can handle with ease. Panasonic RF-1401***1/2 (***** With Antenna Mod – See Full Review) The RF-1401 is a large portable produced in the early 1980’s and is said by many to be Panasonic’s answer to the GE Superadio . While the Panasonic is a very nice radio overall it does not quite match the GE SR I or II in AM performance. It is very good but not their equal, but it has powerful audio with bass and treble controls and a Loudness switch. FM is relatively sensitive not but nearly as selective as today’s DSP portables. Sangean HDR-16 ***1/2 One of the few HD portables available, it is capable of receiving High Definition IBOC channels. 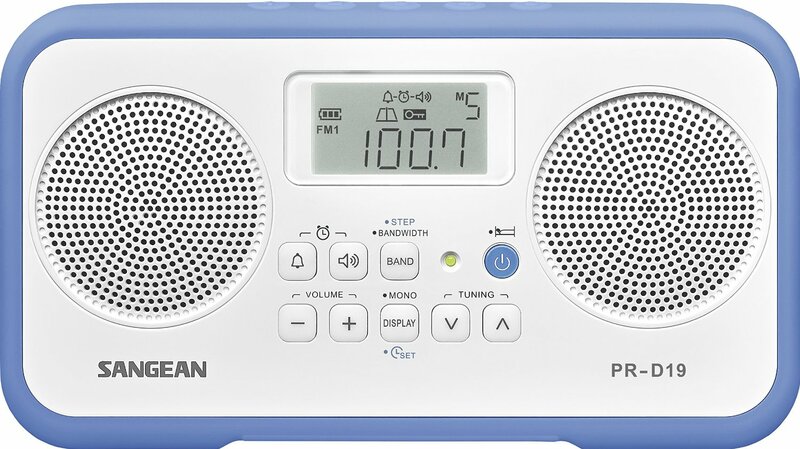 Sangean HDR-18***1/2An AM/FM HD Tabletop Radio the HDR-18 has impressive AM/FM and HD reception even on AC power with the first quiet switching type WallWart power supply I”ve ever tested. 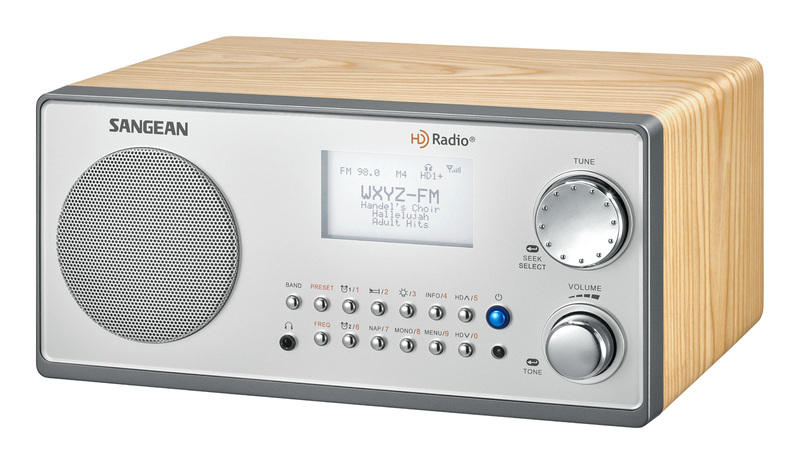 Sangean WR-50/WR-50P***1/2 A high performance table radio with excellent AM/FM reception and sound quality. It is available as the WR-50 (mono) or the WR-50P. It also features FM RBDS and Bluetooth connectivity. *** Three Star Radios are very good AM radios, but show another step down in performance. These radios may have other strengths making them very worthwhile, but these ratings are for sensitivity and overall performance as stand-alone AM portables. Still, if you have noise problems these may perform just as well as the more sensitive radios above…these are still very nice sets. **1/2 Star Radios are actually quite close to the three star radios above but occasionally fall just a hair short of them. They will match the three star radios in many ways on many stations but may fall just a hair short in others…sometimes it’s just a difference in the number of stations they sound authoritative on and it requires very complete tests to notice the differences. In other words, they are highly recommended. 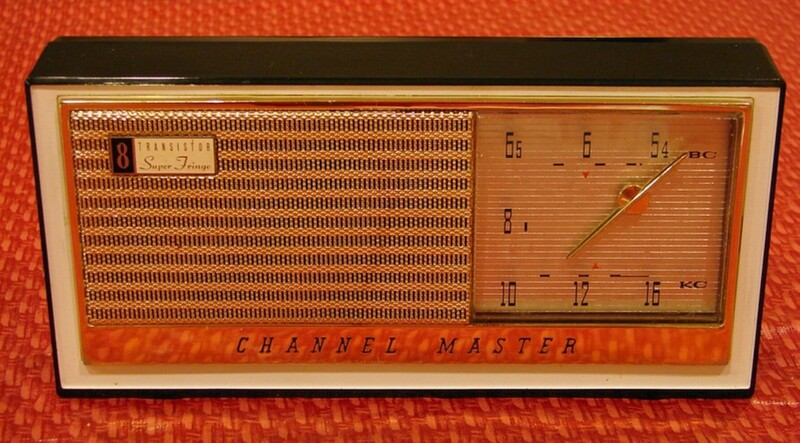 Channel Master 6515 Super Fringe**1/2 A very attractive radio with a deluxe feel and nice sound. 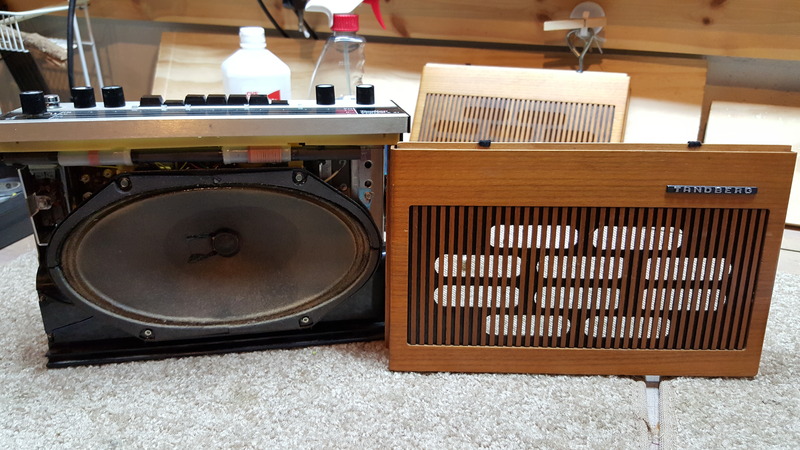 Degen DE-1103 (Early Production)/ Eton E5/Grundig G5**1/2 Very sensitive on all bands for this size category. 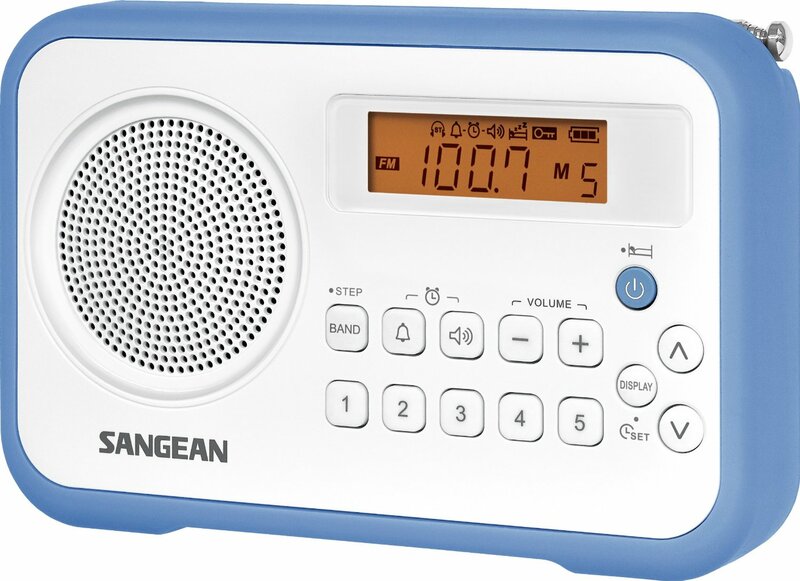 Sangean PR-D6**1/2 An unassuming analog radio with surprisingly good AM – not so hot on FM unfortunately. Zenith Royal 500H**1/2 The popular 500H was the pinnacle of the Zenith 500 series with strong reception in this size group. ** Star Radios are still decently performing AM radios. While they will give you more hiss in the background on medium to weak daytime signals they are still good enough to provide enjoyable reception of typical signals. At night when most AM signals are stronger and sensitivity may be a bit less important they can be fine for scanning the bands to see what’s out there…the ** radios are no slouches and are generally at least as good as the average table radio. Eton/Grundig Satellit** Outperforms the Tecsuns below and the Sangean ATS-909X with less hiss on AM – similar to them on SW and FM. 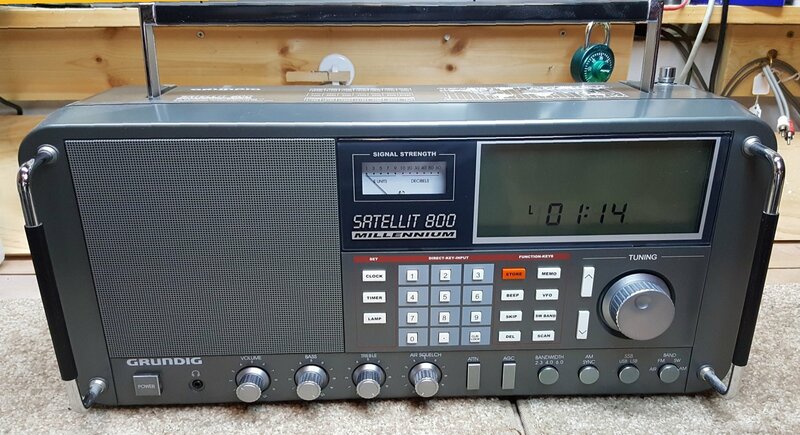 Eton/Grundig Satellit 750/Tecsun S-2000** Two star AM rating on internal antenna but flexible external antenna options and great SW whip sensitivity. FM good but not state of the art. Sangean ATS-405** Stand out AM reception for the low cost…beats the Sangean ATS-909X on AM only. Sangean ATS-909/909X** Really comes to life with external antennas. *1/2 Star radios These don’t quite make it to ** status but are obviusly supeior to * radios and may offer special qualities or features. C. Crane CC-Skywave*1/2 (Unusually versatile band coverage and a top travel companion). 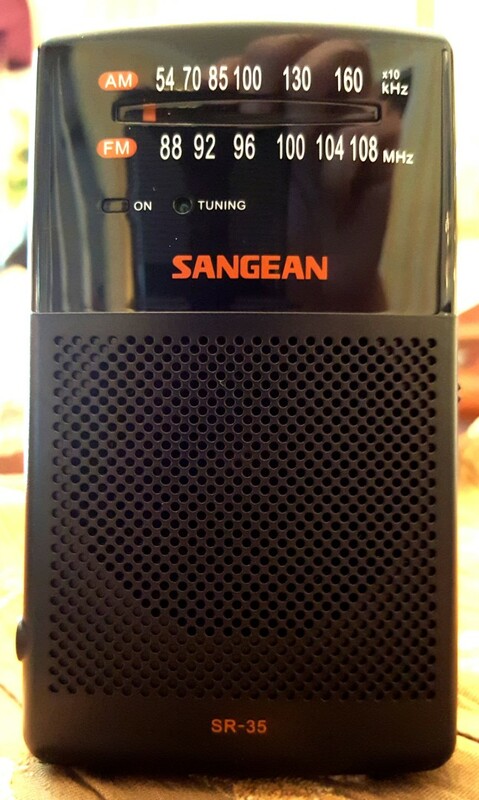 Sangean MMR-88*1/2 A DSP Emergency radio with decent performance…best in the small-sized crank radio class. * Star Radios are usually smaller travel-sized or Walkman-style radios, perfect for stowing in luggage, but also fun for just playing around with at home. They can’t be expected to compete with the radios above – not only do they contain smaller ferrite rod antennas but they are usually less expensive designs. Nevertheless, the best of these radios are remarkably good for their size, some feature DSP (Digital Signal Processing) and excel in FM performance. 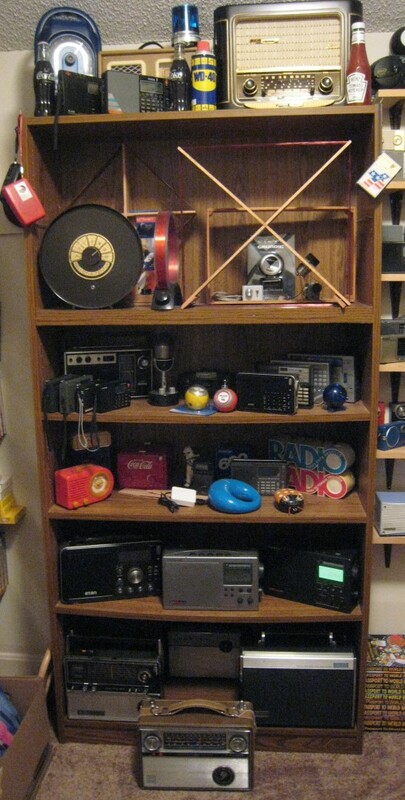 In fact, a subset of the radio hobby has sprung up called the Ultra-Lighters…their Ultra-Light Radios must be no more than 20 cubic centimeters and cost no more than $100 in order to qualify, yet these dedicated hobbyists log stations from all over the world with some of these radios “barefoot” (using no external antennas or aids), while others experiment with modifications or use huge antennas to feed signals into these tiny sets. Often the skill of the operator, which includes traveling to better reception areas or improving conditions at one’s home, is more important than the quality of the radio in achieving good results and the Ultra-Lighters exemplify that concept. They are serious hobbyists and have achieved some amazing results using these small radios. But be aware that the Ultralighters, who often chase Trans-Atlantic or Trans-Pacific DX, often value selectivity above sensitivity because those foreign signals are sandwiched between domestic signals, and also, if you are using an external antenna, sensitivity may be less important than selectivity and overload resistance. 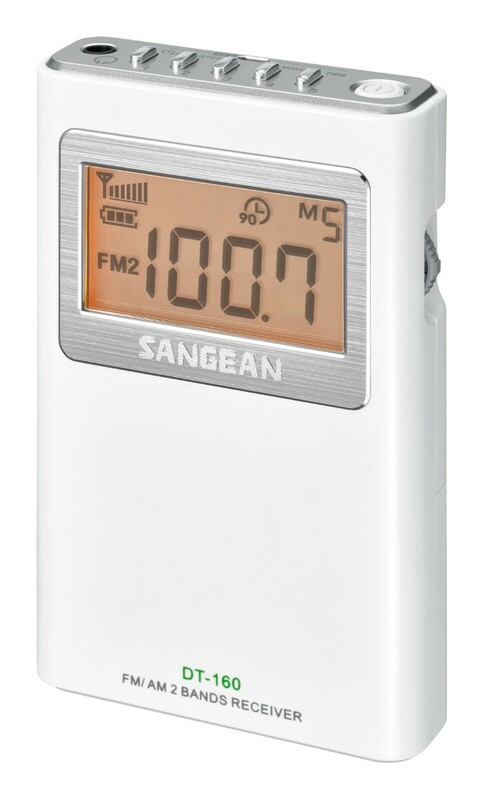 Sangean DT-160* A standout performer on FM. The radios below still rate as ***** and are excellent radios but are very subtly below the rados above as noted. 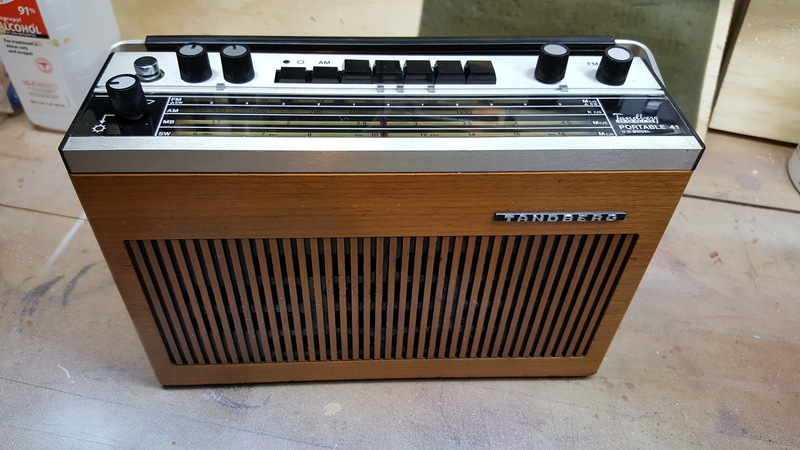 *****Grundig Satellit 205/Transistor 5000 – Another excellent radio overall. The SAT 205/Transistor 5000 is highly regarded among Grundig enthusiasts, but although most of the early Grundig Satellits had phenomenal shortwave performance, this model has the best AM perforamance of any of the Satellit models I have had the chance to check out. Most of these early Grundigs are extremely complex internally and can be difficult to service if needed. *****Nordmende Globe Traveler – From the mid 60’s the Nordmende Globe Traveler is as sensitive as any AM portable I’ve seen. Distinctly European it also features robust audio and multiband coverage. The only downside to this model is its mechanical complexity…the two samples I had on loan both had issues which ended up being left as is due to the difficulty of correcting them. So while I can’t recommend it to the non-technical user, as it may have problems which would be tough to remedy, I can tell you that its AM performance is as good as it gets. The PR-D4W is one of the better performing AM portables made today. 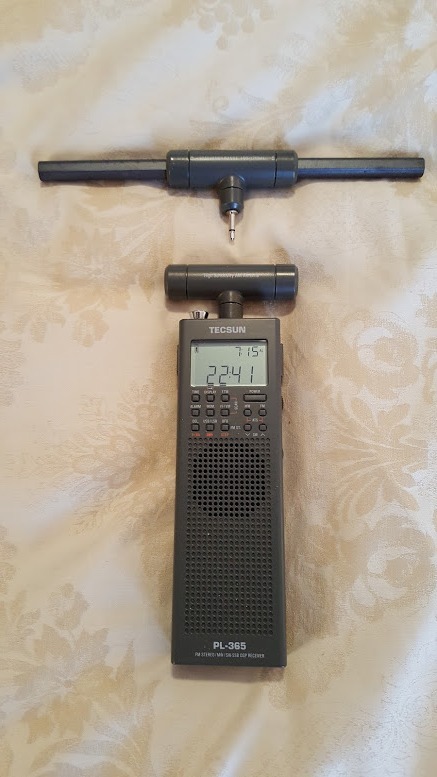 It was so good that I decided to put it head to head with my reference among modern digital portables, the C.Crane CC Radio 2E. The CC-2E beat it on several stations but usually by only a very small margin. Some stations which were completely free of background hiss on the CC had just a trace of noise on the Sangean. Some trace signals were just stronger and more clearly audible on the CC. And there were two stations (710KHz and 1010 KHz) that had spurious noises on them on the Sangean which were clear on the CC. (These frequencies may vary a bit sample to sample). But in the majority of cases the two radios behaved very similarly. I would rate the PR-D4WS as perhaps 95% as sensitive as the CC-2E on AM which is quite excellent considering their cost differential. FM reception is as good as today’s DSP technology gets and the PR-D4W ranks among the very best FM portables I have tested along with the CC-2E and Sangean ATS-909X. ****1/2Panasonic RF-1150 – Cousin to the RF-2200, the RF-1150 offers performance just one notch lower…but so close I’m willing to bet many people would never notice the difference. 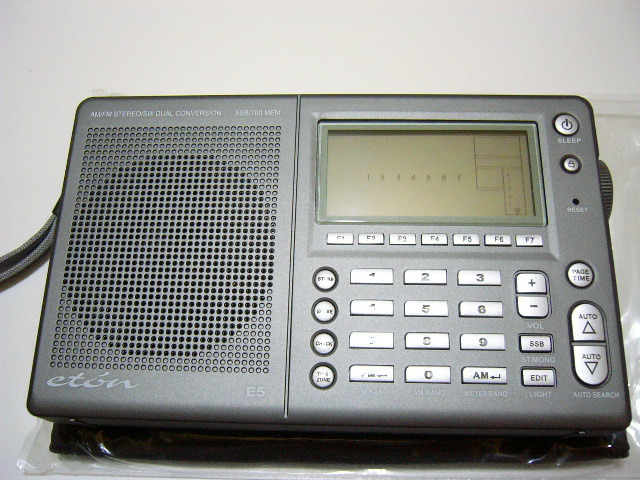 It shares the RF-2200’s rotating gyro antenna, phenomenal sensitivity and excellent quieting curve which make out of town signals sound more like locals than the radios below, but it lacks a bit of selectivity, and becomes slightly desensitized when tuning to signals near interfering stations adjacent on the dial. Uses a ceramic vari-cap tuner instead of the RF-2200’s super air-variable tuning cap and a simpler IF stage. 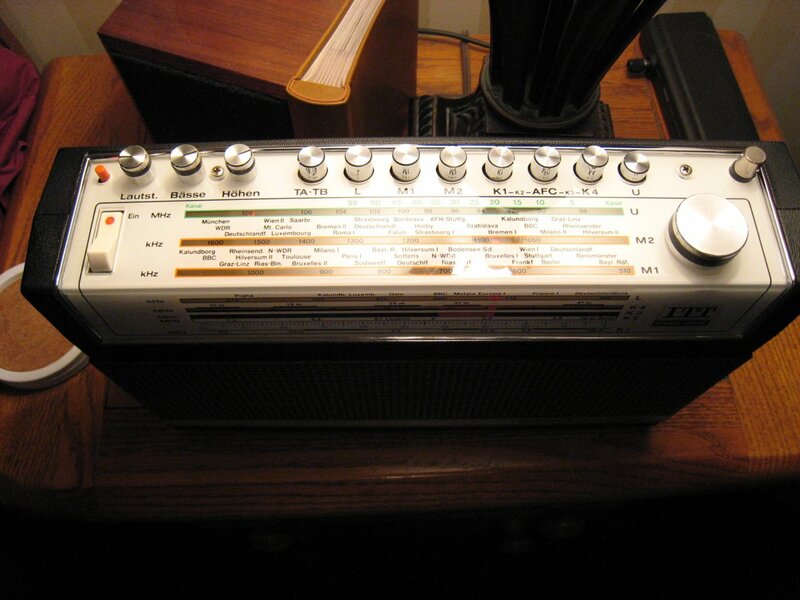 Big audio, also has shortwave and CB in most versions – CB is replaced with longwave in Euro versions. 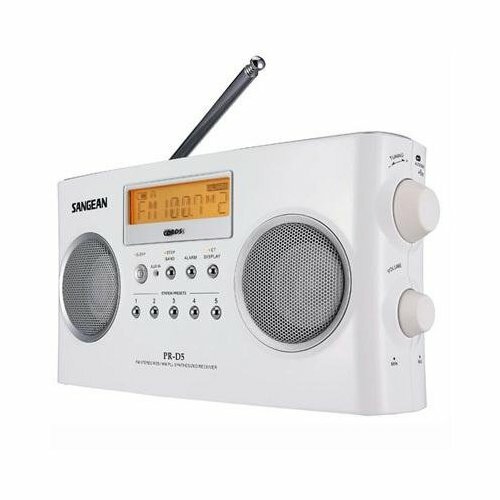 ****1/2Sangean PR-D15 – Successor to the PR-D5, the PR-D15 competes with the best AM radios in terms of sheer AM sensitivity…if a signal is there the Sangean will hear it. An upgrade to the PR-D5 below, the sound is still lacking in treble or bass on this model but improvements include finer tuning increments, bass and treble controls, loudness defeat, built-in battery recharging and a convenient handle. There is also a bit of DSP soft-muting but it is not too heavy-handed and there are few DSP artifacts to mar its overall excellent AM reception. 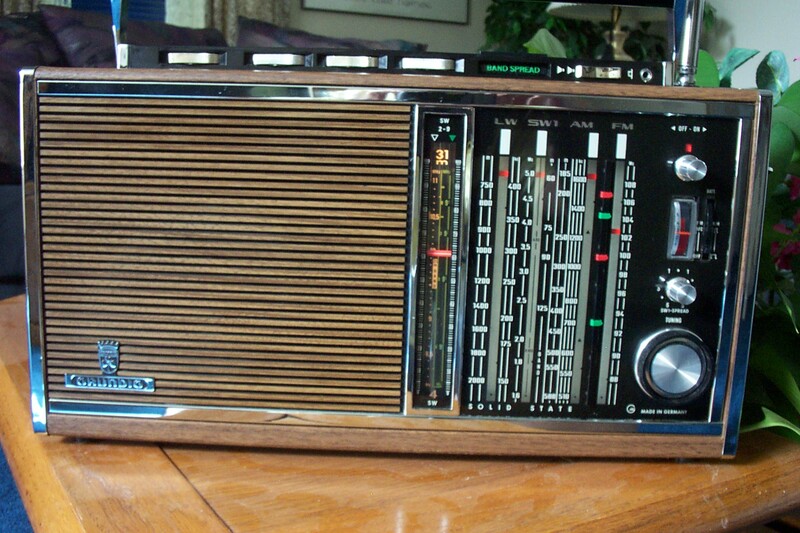 FM has RDS but is not as selective as many of today’s best radios. Still…this is a fun radio to use and very cute to look at. It doesn’t sound bad until you compare it with other similarly-sized radios which have a wider frequency response. Full review: See it at Amazon. ****1/2Sony ICF-EX5MK2 – The Sony ICF-EX5MK2 is an unusual portable radio in several ways. 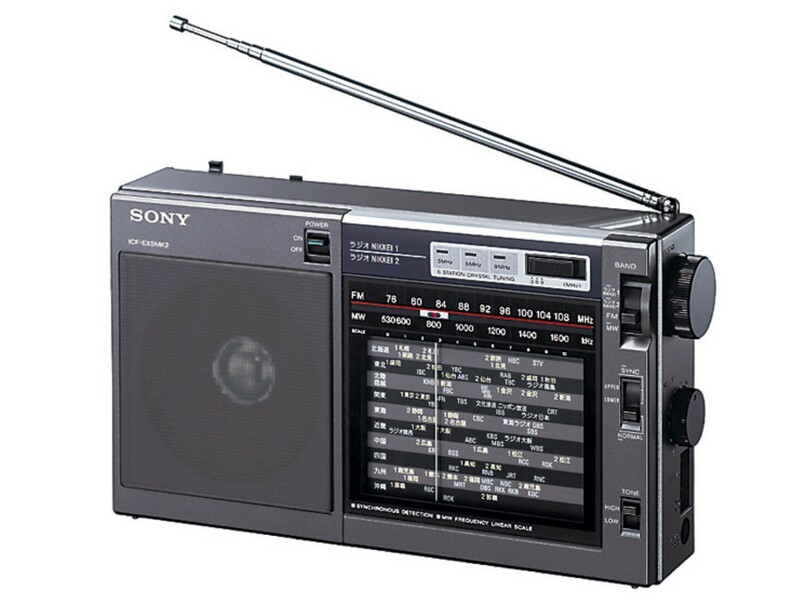 There is considerable mystique surrounding it as it is intended for the Japanese market – its shortwave bands will be useless for anyone outside of Japan, as its SW is limited to 6, crystal-controlled, switch-selectable, non-tunable SW frequencies, tuned to the 6 Japanese NSB frequencies of Radio Nikkei, a domestic, commercial broadcast service in Japan. So for the rest of the world this is an AM/FM, analog-tuned radio. But that’s OK…the EX5’s strength is its AM performance. 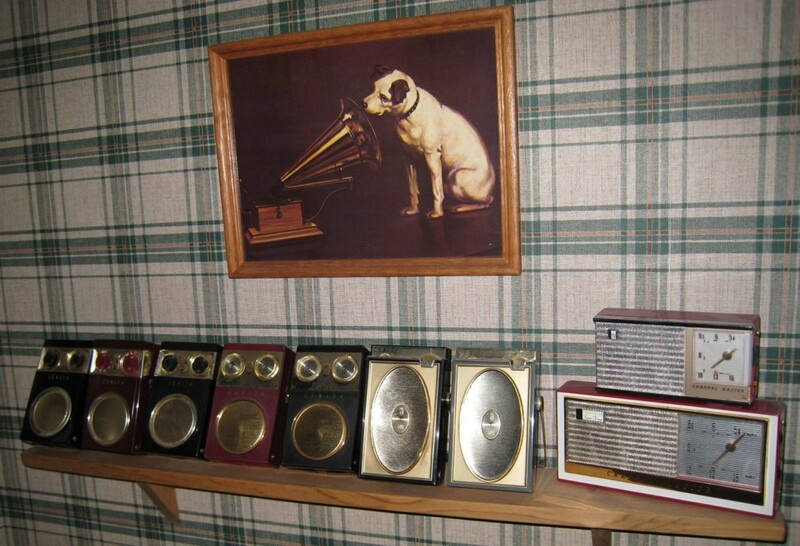 Almost as sensitive as the five-star radios but super selective. Many reviewers have raved about this radio saying it is super sensitive and the best there is but after checking several samples I find it is quite sensitive but a touch hissier on weaker signals than the radios above. However, its uniquely designed synchronous detection makes it among the most selective portables I’ve ever tested. 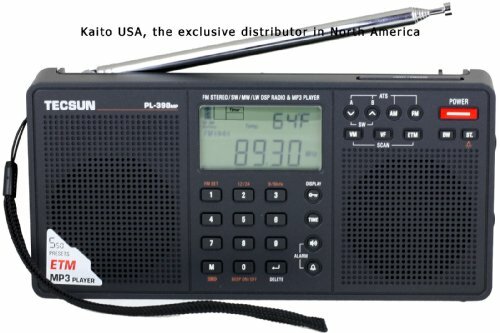 Much to my surprise, after a few years of only being available via eBay from overseas I’ve found this radio is now available here in the US through Amazon.com. Full review: See it at Amazon. ****1/2 Grundig Satellit 208/210/Transistor 6000/6001 – The various model numbers listed here differentiate 4 variants of an essentially similar model. Long known as a super SW receiver this Grundig can be quite good on AM as well but the AM performance varies a bit more sample to sample…this rating pertains to the best of several samples I evaluated. Excellent selectivity but somewhat more high frequency roll-off than I prefer, yet overall a beautiful radio with a that big “Grundig Sound”. Best SW portable sensitivity available. 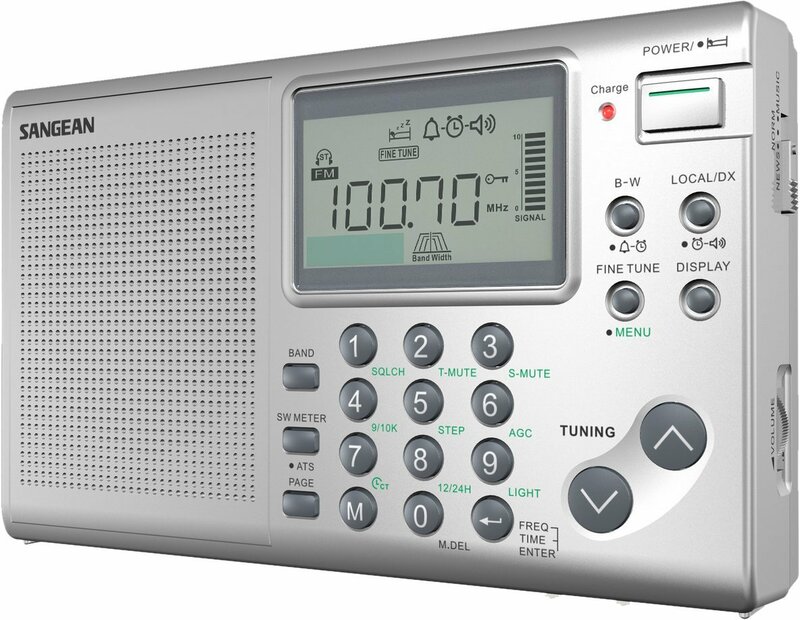 Sony ICF-6800W ****1/2 – A hair noisier on medium strength signals than the ***** radios above but very sensitive to the faintest traces of signals this is a solid AM performer and its SW is among the best of any radio tested. SW whip sensitivity is phenomenal. The so-called “Orange” version – serial number 30,000 and higher, is the one to look for – it is generally considered to be a better performer and less troublesome than the earlier “White” version. (See explanation in the full restoration article here). The ICF-6800W has a very deluxe feel with its combination of large, user-calibratable drum-style dial scale along with digital readout and it has very good filters and conrol flexibility. This is one of Sony’s best portable world band receivers. FM performance on the other hand is ordinary…fine for your usual stations but no DX selectivity champ by any means on FM. 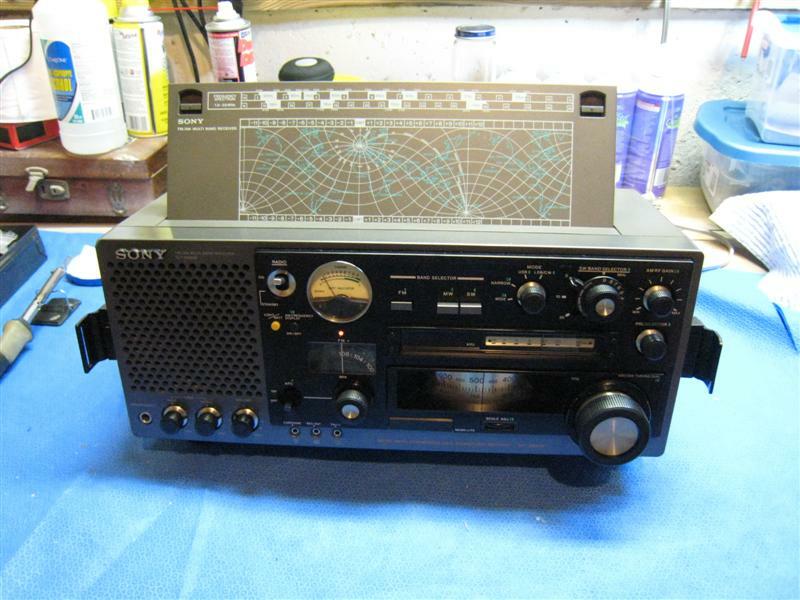 **** Sony ICF-2010 – A landmark radio for Sony during the early days of digital. I love the 2010 and have owned several. 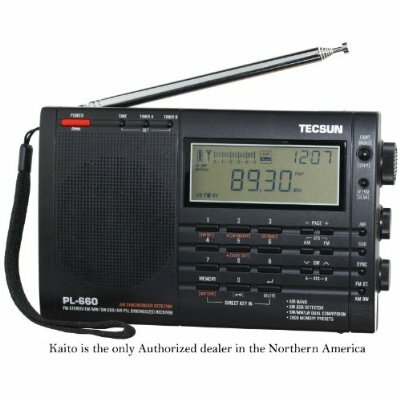 I still use mine quite often, but although it is a classic in every sense of the word, with strong performance in many areas, including better synchronous detection than many of the current crop of mid-priced radios along with excellent SW reception with its whip antenna, its raw AM performance has been eclipsed by the radios above it on this list. On my band scans it was unable to hear any trace of some of the very weak signals which I could pick up on the more sensitive radios…a victim of a bit of unsuppressed digital noise. Some, not all, of the medium strength AM signals seemed a bit noisy on it too, partly due to its extremely crisp frequency response…this same character which helps the 2010 make weak SW signals decipherable also makes noise more obvious for the program listener. The 2010 is still a joy to use with the simplest memory system of any multi-band radio and legendary Sony quality. And for SW band-scanning using just its whip antenna it is still a joy to use. FM performance is ordinary…fairly sensitive but not very selective by modern standards. Better SW than any currently made portable. ****ITT 103 – Not many people here in the US are aware of the name ITT/Schaub Lorenz. This vintage mid 70’s European analog radio is without a doubt the most powerful, accurate sounding radio anywhere near its size I’ve ever heard. This radio puts out an honest 2 1/2watts of undistorted audio power when running on D cells and 4 ½ watts when running on AC and simply put, it can fill a large room authoritatively, and it has some real bass articulation…not booming one-note bass. AM reception is excellent…it does not quiet quite as quickly as the five star radios which means some mid strength signals will have just a bit more hiss behind them, but when it gets down to signals at the threshold of audibility the ITT holds its own. The ITT is also super selective and is thus a great candidate for serious DXing and features an AM band which is split into two segments which allows good precision on its analog dial scales. FM reception is good but shows some kind of signal break-through in my location so some stations could not be received…but again, on most signals its FM sound is absolutely amazing. It also offers good SW performance and the styling is beautiful. Read The ITT 103 Review. Grundig Satellit 800 ***1/2 The often-maligned Satellit 800 is an excellent desktop receiver which combined modern (for its day) digital features with old-school analog-like performance engineered by the well-respected R.L. Drake company. 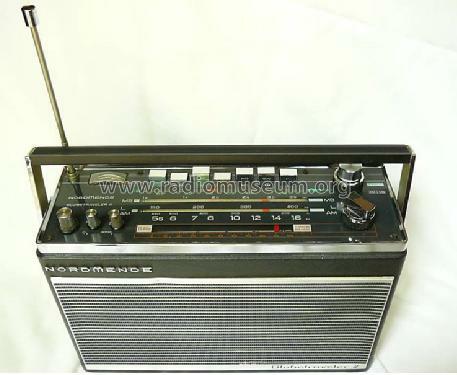 Hardline Grundig lovers disparaged it primarily because it occupied the same bulk as the vintage Satellit 600/650 series which indeed were built like military tanks and featured very high power audio amplifiers. Yet in terms of actual RF performance the SAT 800 outperforms the older 600/650’s on side-by-side comparisons. The SAT 800 also has a relatively small AM ferrite rod but nevertheless receives AM signals as well as the older 600 or 650 did despite their larger antennas. And with external antennas the SAT 800 is of reference quality rising to ***** performance on AM and SW. Read the full Satellit 800 Review plus here is a speaker modification I did to improve its audio significantly. Good FM. 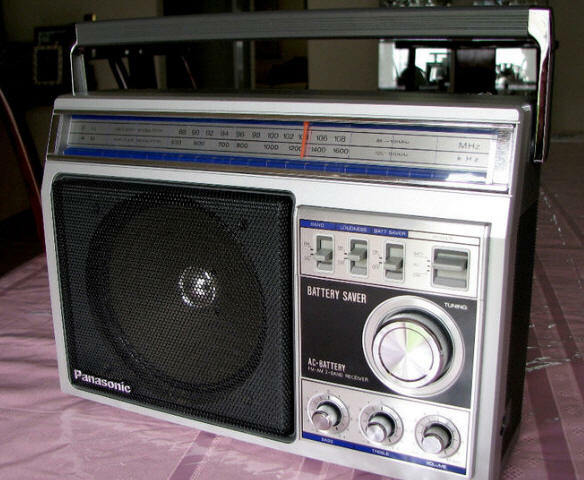 Panasonic RF-1401***1/2 – (***** With Antenna Mod – See Full Review) The RF-1401 is a larger portable produced in the early 1980’s and is said by many to be Panasonic’s answer to the GE Superadio which it superficially resembles. 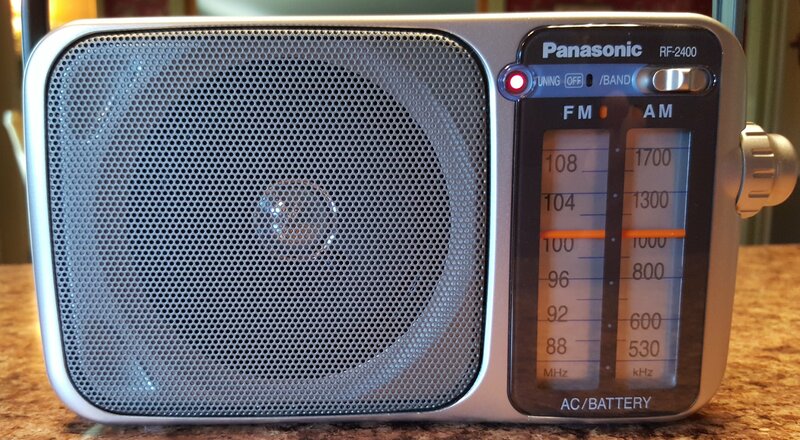 While the Panasonic is a very nice radio overall it does not quite match the GE SR I or II in AM performance, but it is at least as good if not better sounding and similar in FM reception.. It has powerful audio with bass and treble controls and a Loudness switch. FM is relatively sensitive not but nearly as selective as today’s DSP portables. 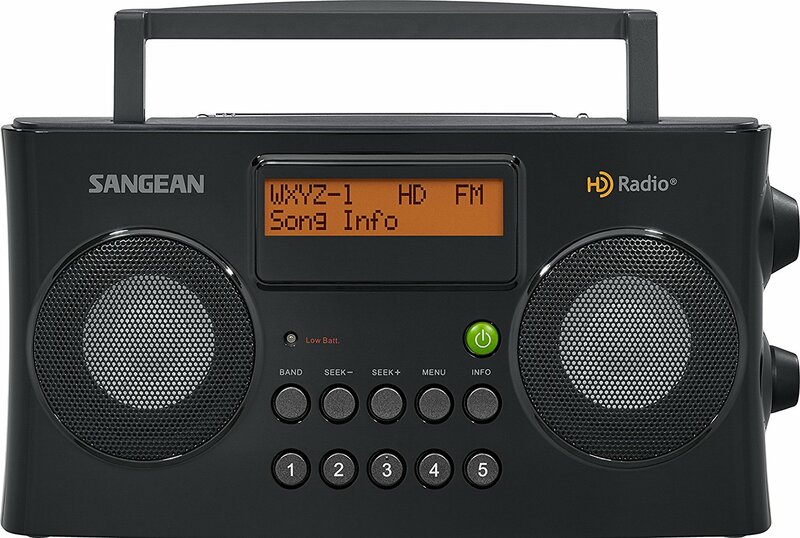 Sangean HRR-16 ***1/2 The HDR-16 is an exciting radio offering great AM/FM HD portable reception and has few if any competitors on the market. It’s analog perforamce is very good coming in at ***1/2. 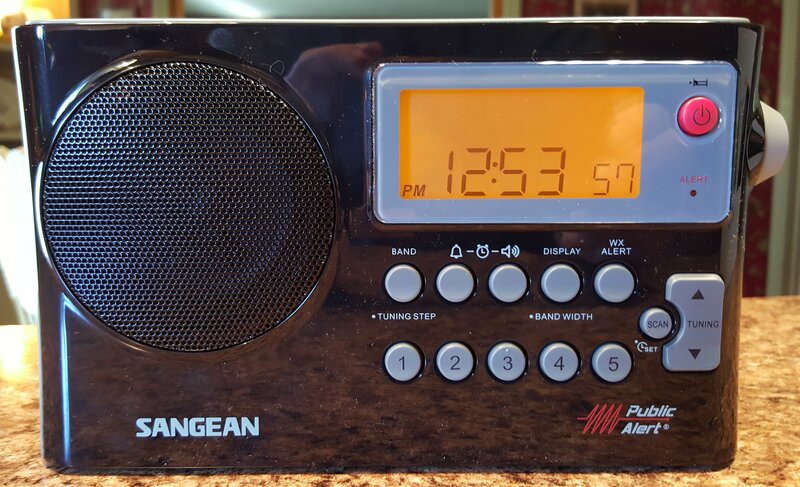 ***1/2 Sangean HDR-18 AM/FM/HD Tabletop Radio – This one was a surprise. Not only is this the first table top (AC Powered) radio I’ve tested that performed so well on AM the HDR -18 also has excellent FM and HD reception, locking into weak HD signals which older HD rados could not receive. It represents real advances in the DSP state of the art. It also has nice sound for a small tabletop set and is fully featured with a remote control which all combine to make it a joy to use. ***Sony ICF-6500 – The 6500 never got many positive reviews when it was released, perhaps due to its rather unexceptional SW performance. However it does better on AM than SW, bringing in weak signals almost as well as the highly-regarded 2010 and it sounds better too. The 6500 is also a fun radio with analog, slide rule tuning and a rotating band selector drum like the transistorized Trans-0ceanics and Sony CRF-5100 (although this radio is not in their overall class) plus a digital readout and analog signal meter, which is cool but unfortunately, over-reads. It also features two-speed tuning and is just a pleasant radio to use. Somewhat of a sleeper, this is one of Sony’s better AM performers. ***GE SR III – The last of the Superadios, the SR III is both liked and disliked depending on who you talk to. The reality is that it has strengths and weaknesses compared with the earlier SR I (more correctly the SR…it was not called the SR I) and SR II models. Weaknesses: Mechanical quality was obviously reduced – the SR III feels very “plasticy” compared with the much heavier SR I and II, and the three-gang air variable tuning capacitor of the earlier models was replaced with a varactor tuner which compromises ultimate performance. The slide rule tuning dial is harder to see and generally less well calibrated and the controls feel flimsy. The main problem is it has s higher AM noise floor than the higher-rated radios…weaker signals are heard with a bit more hiss in the background. But overall AM reception is still very credible. 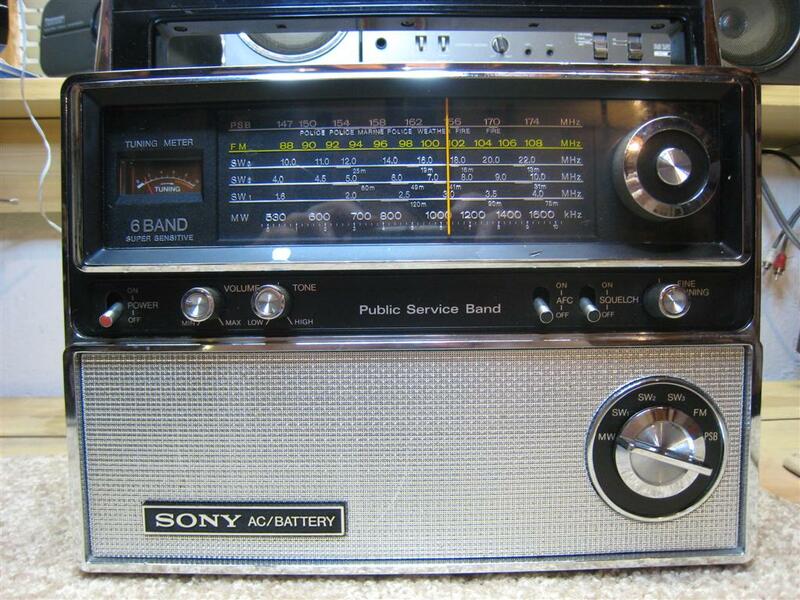 On the positive side the SR III represented a heck of a lot of radio for the cost and is a decent performer overall. The radio sounds amazing in some ways…comparing it with the older SR’s the SR III has obviously wider frequency response…it sounds very full and robust on AM…lots of fun to listen to. It achieves that wide response through a bit of judicious tonal shaping which has one drawback of limiting the maximum clean volume the radio can put out. It sounds full and lush at reasonable levels but don’t push it or it will distort unless you reduce the bass a bit. It also has a once-common but now very unique feature…a super wide Wideband AM mode that allows strong local AM signals to sound like FM…but for weaker signals he Narrow Bandwidth setting is more “Normal”. If you’ve never heard an SR III you’re in for a treat. One caveat: A big problem affected the SR III for approximately the last two years of its production – the varactor tuning pot was changed to a new one which causes very erratic, almost unusable tuning action. This problem affects many, but not all of the last of the units which still carried the GE name and many of those carrying the RCA name. The problem is that it is almost impossible to get the radio to tune to some stations, especially near the upper end of the band. The only solution is to replace that pot with a better one but evidently no exact match has yet been found so only enterprising souls who are able to modify things can install them, so buy any late-manufactured SR III, either a GE or an RCA, with this potential problem in mind. This is one case where finding an older unit may be more desirable. Read The GE Superadios: An All-Time Classic. 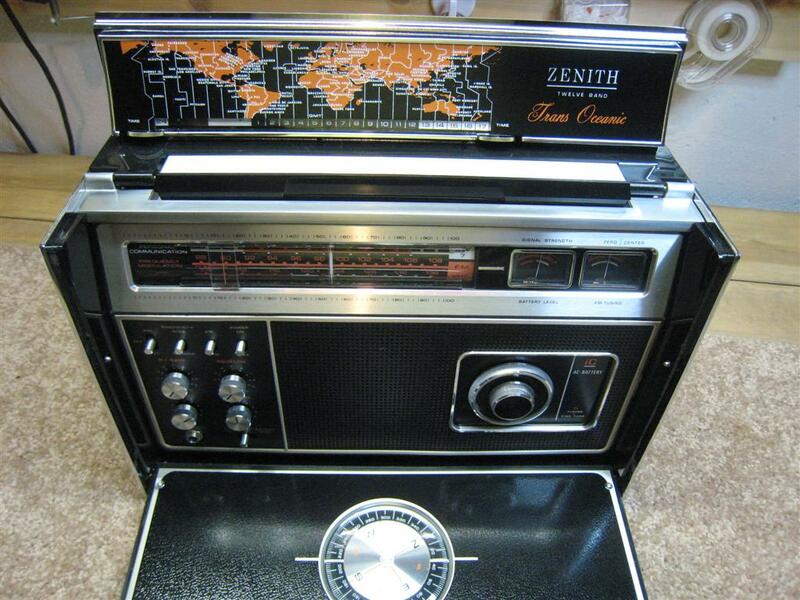 ***Zenith R-7000-2 Trans-oceanic – The last of the Trans-oceanics, the R-7000-2 was a complete internal re-design and shares nothing in common (except most of the cabinet) with the Royal 7000 which preceded it. 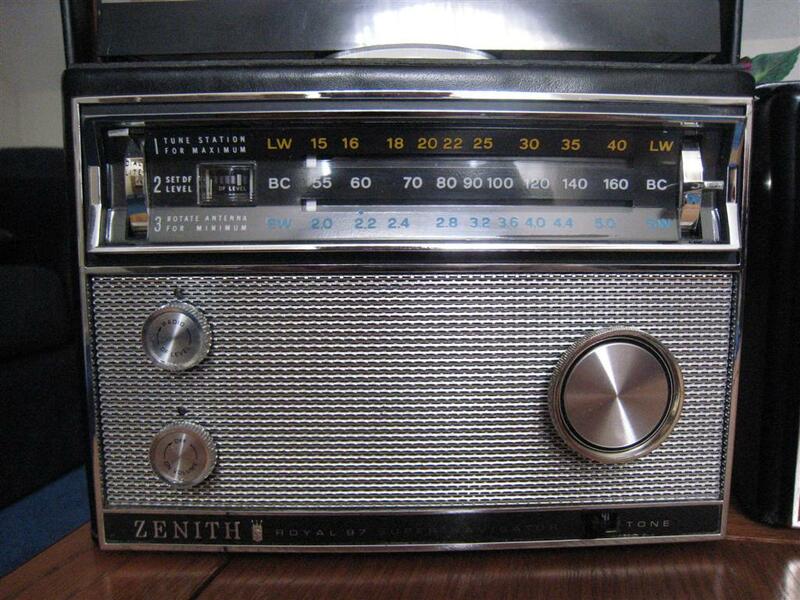 It is a controversial model with some purists insisting it was a big step backwards for Zenith, yet the radio itself is gorgeous and a fine performer. The two models (R-7000 vs. the earlier Royal 7000) vary considerably in their internal design but perform similarly on AM. Sensitivity and selectivity are about the same although they varied on several weak signals…some seemed a bit more solid on the Royal 7000 while some were better on the R-7000-2. The difference was primarily in the character of their noise floors with each radio being clearly superior on some signals over the other one. The R-7000-2 has somewhat richer sounding audio which makes most listenable signals sound a bit nicer. Good FM reception is represetative of portable radios of its era with good sensitivity but average selectivity. 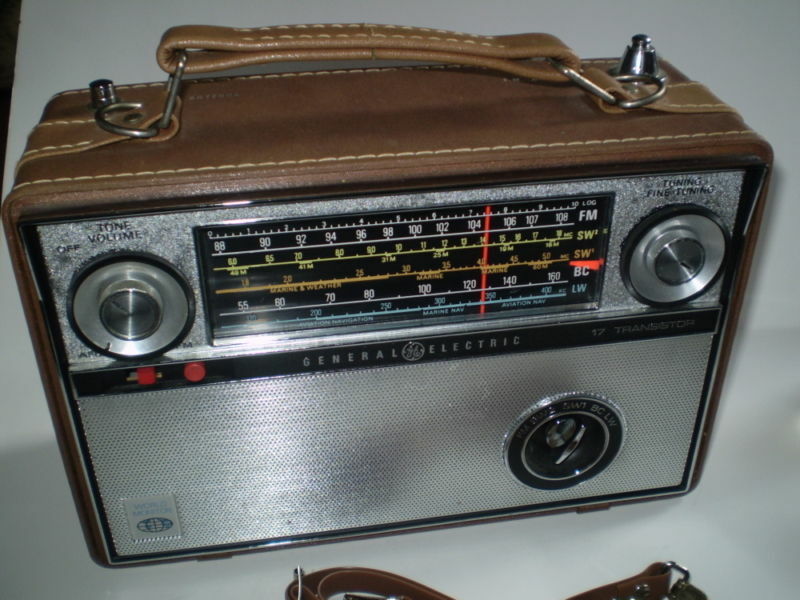 ***GE P-990 World Monitor – GE’s mid-1960’s leather encased multiband portable is a sturdy, heavy and impressive thing to behold with two whip antennas…one of them a huge SW mast the other a smaller FM rod and a large, colorful slide rule dial that I really enjoy. 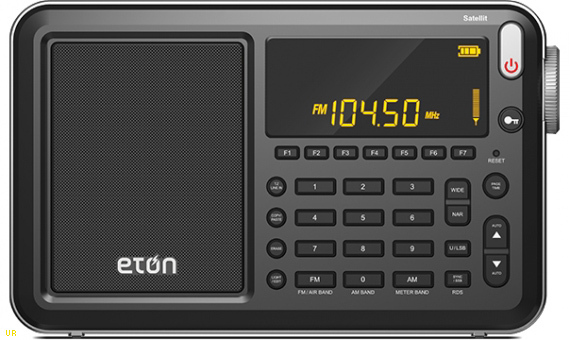 It features fairly decent if not top tier reception on all bands…it’s a nice analog radio for band scanning with a fine tuning knob that works on AM and SW.
***Eton/Grundig Field 550 – The Field is a definite improvement over the older S350/S450 Field models. It offers good reception in a nice-looking, easy to carry package. Being digital it offers rock steady tuning which the original S350 series did not, and it also offers enhanced reception. I did note some “digititus”…DSP-induced digital noises on the AM band which was a surprise since I detected none of that on the three other new Eton DSP radios. ..this was been corrected on later production. One negative – it does mute while tuning as many other modern radios do which makes band scanning a little less enjoyable…your mode of use will determine how much this is a factor for you. 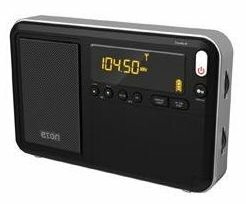 The Eton Field is a nice radio and a good value in a lunchbox-sized radio that covers AM/FM/SW with great reception and decent, if not boombox sound – great bang for the buck. It’s a handsome and fun radio and it can accommodate many types of external antennas with dedicated inputs for each band…a nice touch. Overall I give it a thumbs up! read The Full review See it at Amazon. 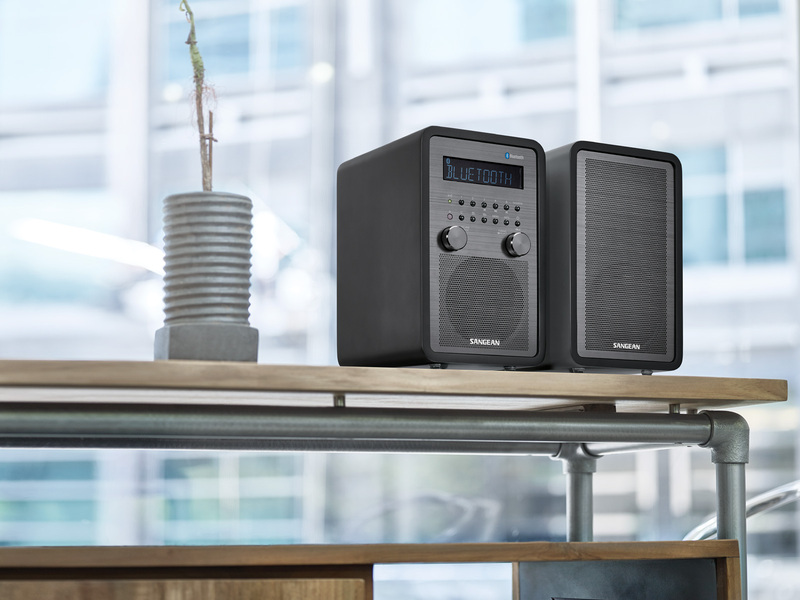 Note: The Field 550 has been replaced by the Field BT which adds Bluetooth connectivity and has a greatly improved speaker. Unfortunately the two samples I tried and reports from several sources indicate that there is a severe problem with AM sensitivity, at least at the top third of the AM band. I am waiting to see if this is rectified in later production before reviewing it because I deemed the two radios I bought and returned to be defective and clearly Not Acceptable. Hopefully there will be more to come on this. 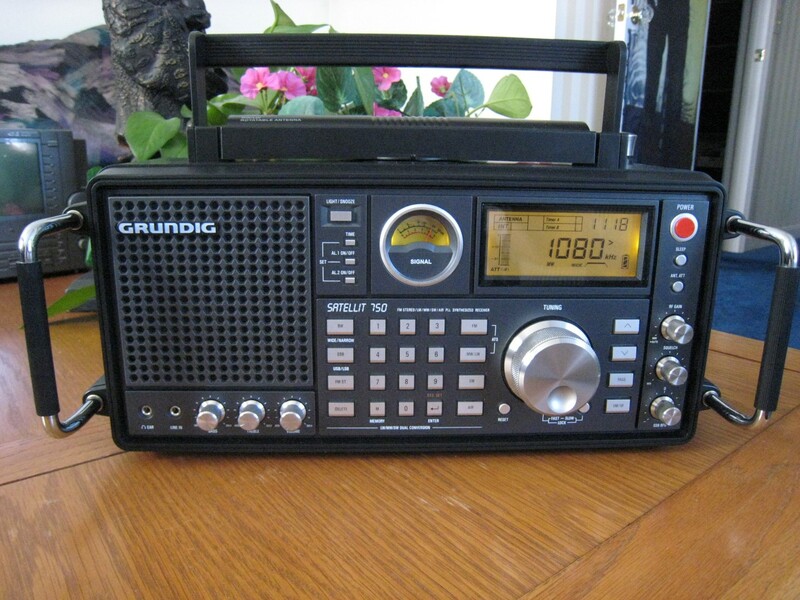 ***Eton/Grundig Field S350DL – The S350DL was an upgrade to the previous S350 (see below). It offered a slightly larger cabinet to accommodate an improved speaker, with more extended high frequency response for crisper audio, increased AM sensitivity, improved display lighting and a nice flywheel effect tuning mechanism. It also offered the ability to run on either AA or D cells in addition to AC power. While these radios were mediocre on FM and especially SW, they were not bad performers on AM, but they are fun to bandscan with. 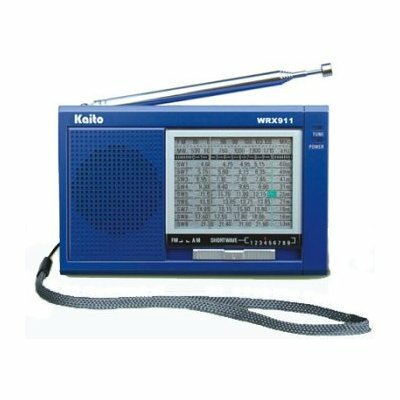 ***CC Radio-SW (Redsun RP-2100/Kaito KA-2100) – These radios are pretty much the same except that the C.Crane version uses an external Wall-Wart AC power supply while the Redsun/Kaito versions have it built-in. This radio offers decent AM performance and powerful audio sounding better than the two radios above. Again, weak AM signals will have just a bit more hiss behind them than the radios higher on this list. You will also get very good FM and SW reception, along with two IF filters for extra selectivity when needed. A great value on the current market although direct frequency entry would have made it a bit easier to navigate through the bands. ***Sony TFM-8000W – Another entry in Sony’s Super Sensitive Series this is the baby brother to the three star CRF-5100 above. It is a hair less sensitive on SW but excellent on AM and has rather mellow audio which not everyone will like, but it is one of only a few radios in this entire list to offer true flywheel tuning which is wonderful to use and is extremely rare in a portable radio. The straight-forward dial scales are visually appealing and a signal meter is also a nice addition…this is a fun radio to band scan with and I really like its looks and solid feel. 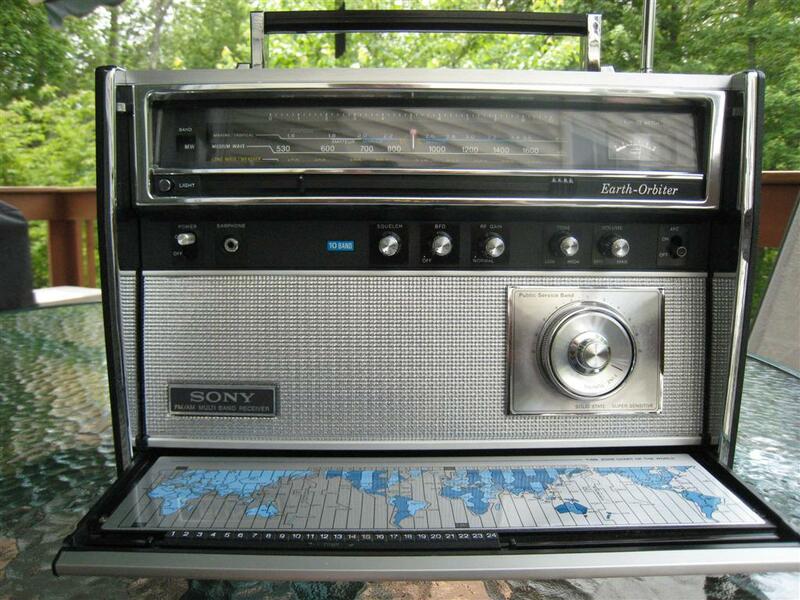 Another 1960’s model from Sony’s “Super Sensitive” series this cool-looking radio really performs. 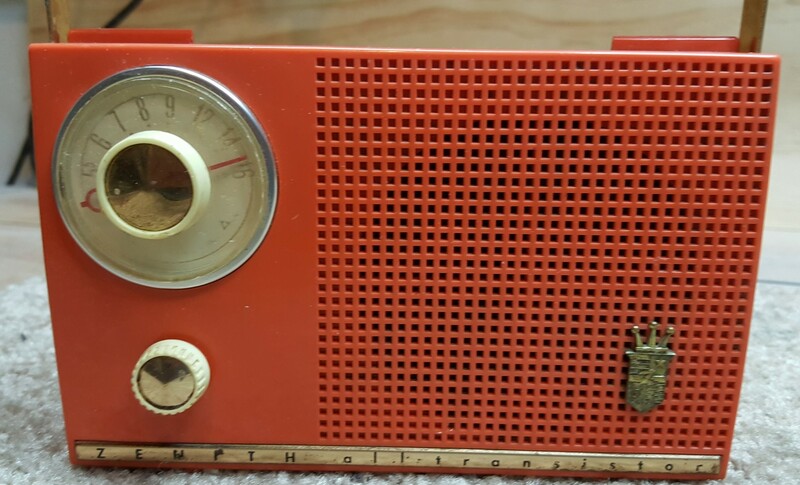 It features a three-gang air variable tuning capacitor with a Tuned RF stage and 9 transistors for powerful reception and audio for this size radio. (9 x 5 x 2.5”). 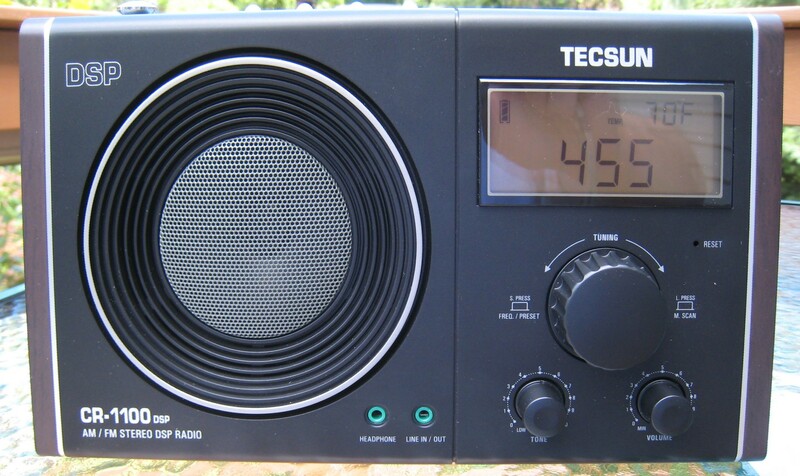 It features a nice vernier tuning dial which allows very precise tuning and a Hi/Lo tone switch…but the main thing is that it pulls in weak stations as well as any of the three star radios in this group. Although most of the other *** radios are larger and have “bigger” audio the 6R-33 has pleasing audio and will run for hundreds of hours on 3 D cells. This one was a great find. The Realistic 12-675 TRF retailed for $27.95 and was sold between 1968 – 1972. 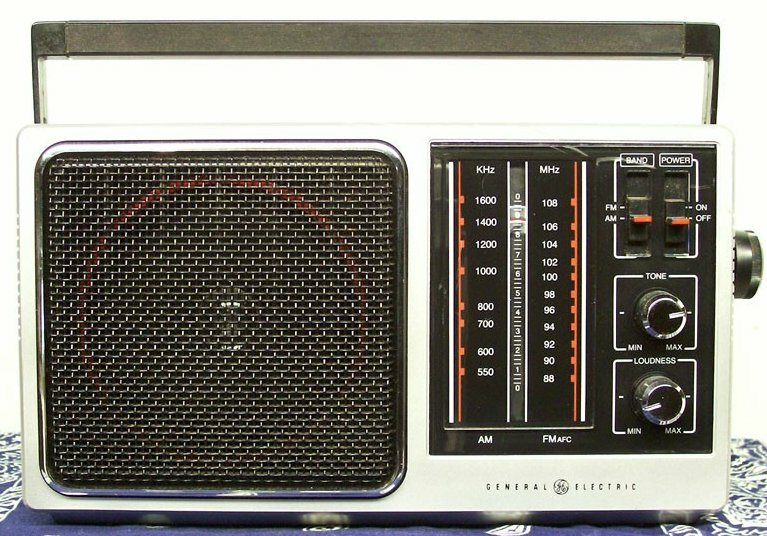 Featuring a tuned RF stage and three gang air-variable tuning condenser they were aggressively promoted by Radio Shack as their top of the line AM portable radio – several of the catalogs (pictured in the complete review) promising “almost incredible 100 mile day light sensitivity”. 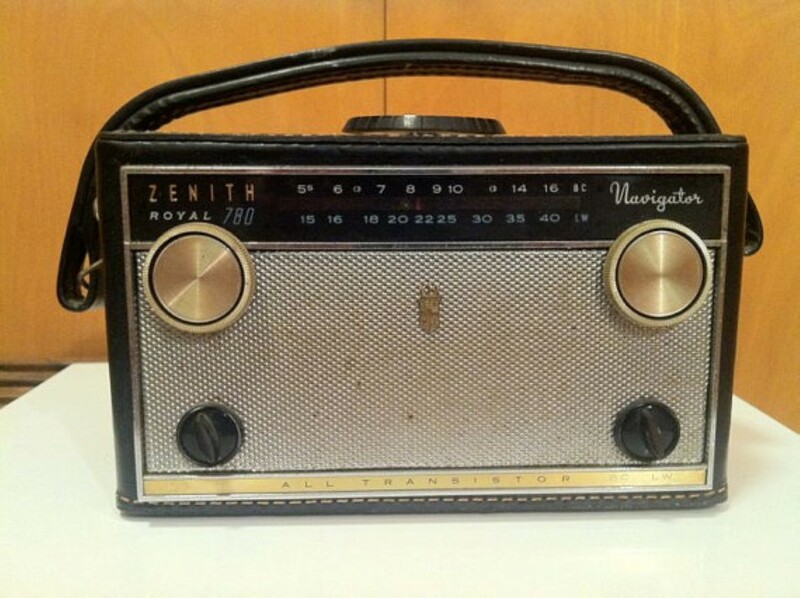 While they were an excellent value at their price point they certainly did not compete with some some other 8 transistor radios such as the much earlier GE P780 or the later Superadios and Zenith lunch box sets, but to be fair those other radios were considerably more expensive. I found the 12-675 to be a good but not spectacular performer placing it squarely in the*** group for reception and with mediocre sound quality. Replacing the stock 6” ferrite rod with an 8” rod elevates the radio to ****. 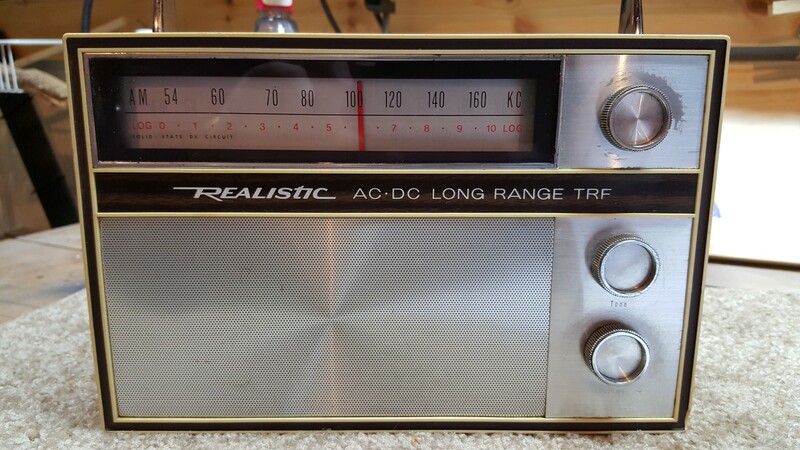 Reality check time – browse down on this list and see how many radios don’t measure up to this $70 radio from the early 1960’s! 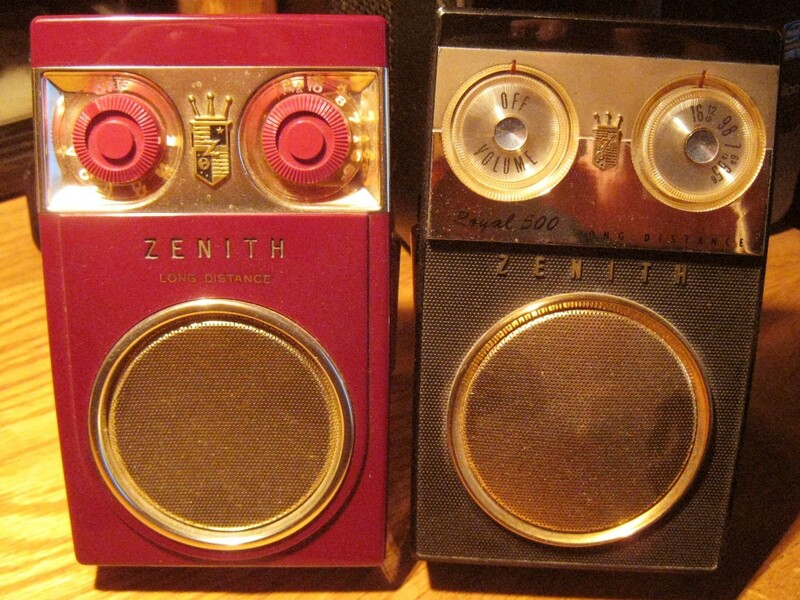 The 500H was the best of Zenith’s “pocket radios” – although you’d need a very big pocket (and very deep as well…$70 in 1961 dollars equates to $475 – $554 in 2016 depending on which calculator you use). 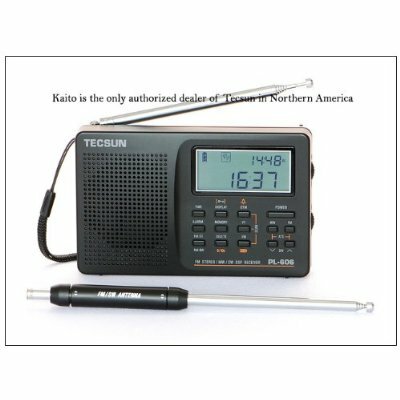 Nevertheless the 500H will pull in weak stations better than most of today’s sub-$150 radios. It’s just a good combination of sensitivity and decent audio for the size that is very satisfying and as you tune across the dial you will find it full of listenable signals that will sound much more noisy on lesser radios. Very comparable to the DE-1103 group above, although not quite as selective. Read The Royal 500 Series Article. 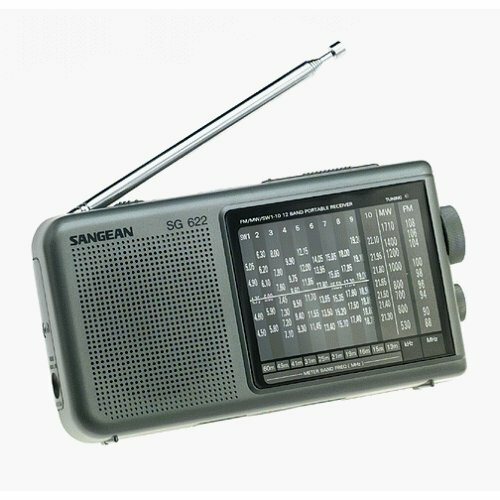 The Sangean PR-D6 is a simple, analog-tuned portable radio covering standard AM (520-1710 KHz) and FM (87.5-108 MHz) bands, available in Black, White or Blue and is a little gem for AM radio lovers. AM is the strong point of the PR-D6. I was surprised at how loud and clear my usual test stations were. I had to pull out several other reference radios to find exactly where the PR-D6 lands in the overall scheme of things and again I was surprised to find it earned a solid **1/2 Stars in this list. In fact it was only a few points shy of making the *** group list…impressive AM performance indeed! FM was more typical of this class of radio – it was fine for usual reception of local and suburban grade signals, but for AM it’s hard to match for the money. **Sangean ATS-405 – The ATS-405 AM reception was quite a bit better than the Tecsun PL-660, PL-680 and PL-880 which were hissy on AM by comparison. The Sangean was about on a par with the Eton Satellit on AM reception. This is great performance at this price level. The AM was also refreshingly free of digital hets or birdies which are common with many DSP portables and with the ability to defeat soft-muting and tuning muting it is a delight to band scan with. This is a great little AM portable. SW performance is decent but not stellar but this is a good FM receiver with excellent selectivity although it was not quite as sensitive as today’s best FM portables. Most of my usual stations came in just fine but I was able to dig out a few very weak signals on other radios that were just not there on the Sangean. 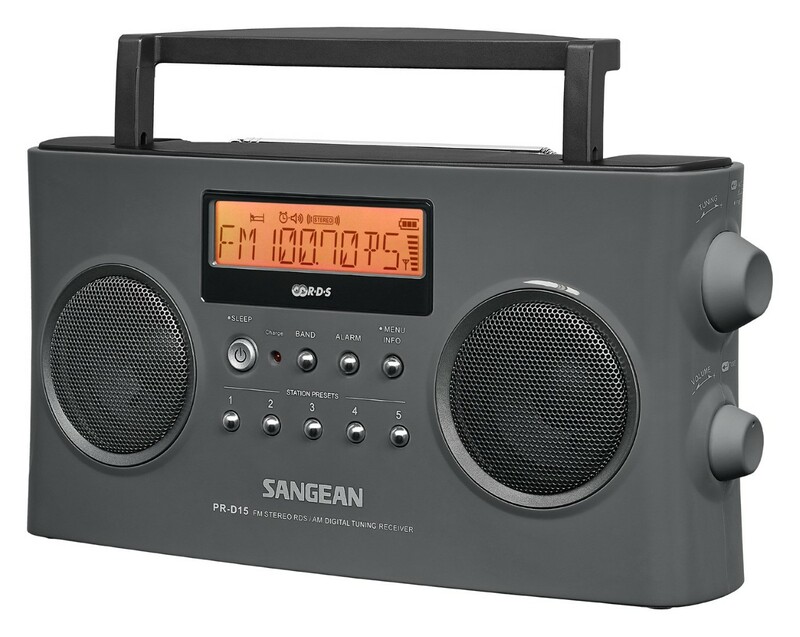 ** Sangean PR-D19 AM/FM Stereo Radio – Sangean’s PR-D19 AM/FM Stereo radio is the logical upgrade to their already popular PR-D18 portable radio below and is also availaable in several colors. I am happy to report that the PR-D19 features superb FM reception and somewhat enhanced AM reception compared with the mono PR-D18. There are also a few additional features which make the PR-D19 an even more desirable upgrade than the addition of stereo alone might suggest. 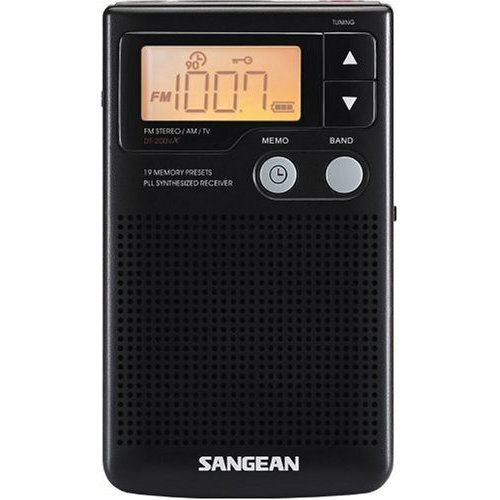 ** Sangean PR-D18 – The Sangean PR-D18 radio is a straight-forward DSP-based AM/FM portable radio. It lists for $69.95 but is easily available for considerably less…around $47 as of this writing. For it’s size and price it has excellent FM reception and very good AM reception, good sound, all in a rugged, sturdy little box. Very cute too in 4 color combinations. GE 7-2857A** – One of a few “Baby Superadios” which have a well- deserved following, the GE 7-2857A is a strong performer, even if not really in the Superadio class. 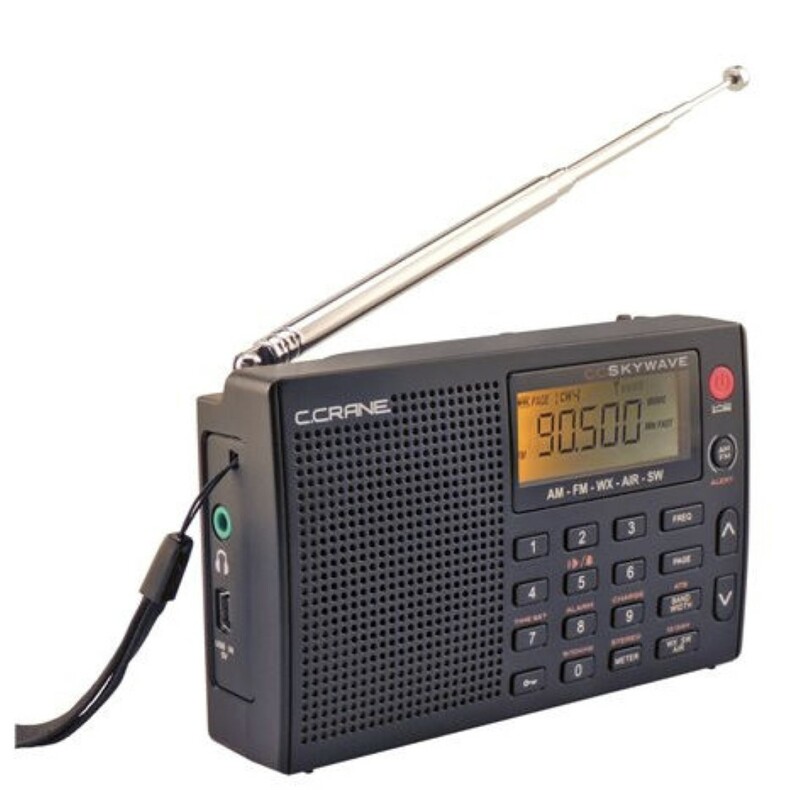 It has great audio for the size with a useful tone control, very good AM reception at the top of the two star group, and a clear slide rule dial which makes it easy to find your desired stations. A real bargain on the used market these are fairly easy to find at reasonable prices and generally arrive in good working order. OK on FM. Recommended! 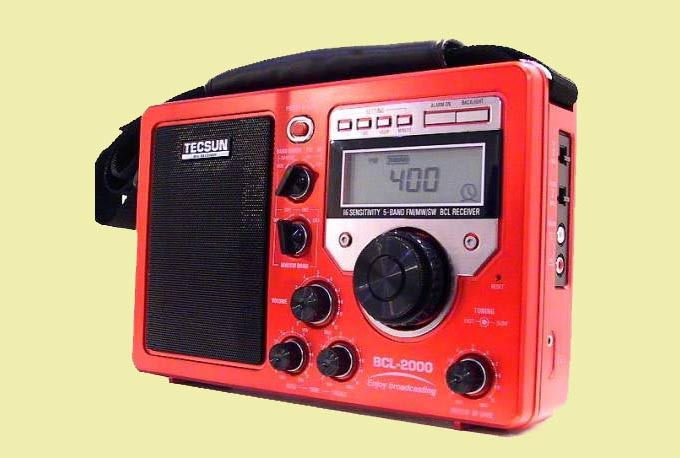 ** Eton/Grundig Field S-350/Tecsun BCL2000/BCL 3000 – The Tecsun BCL 2000 was the first in this series of “Field” radios. It was available in flashy red, Black or Silver. Soon Eton/Grundig introduced a US version called the Field S350…the same radio but in silver only. 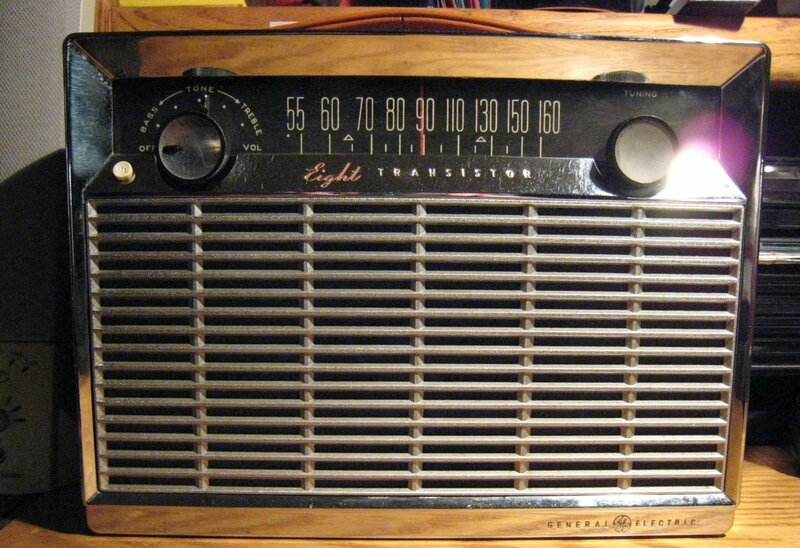 They featured decent AM performance but as inexpensive analog radios with digital readout it became obvious that there was noticeable drift…the radio would drift off frequency after a while necessitating re-tuning. The drift was far worse on SW due to its higher frequency…the SW was also plagued by strong images…ghosts of signals on frequencies where they should not appear. 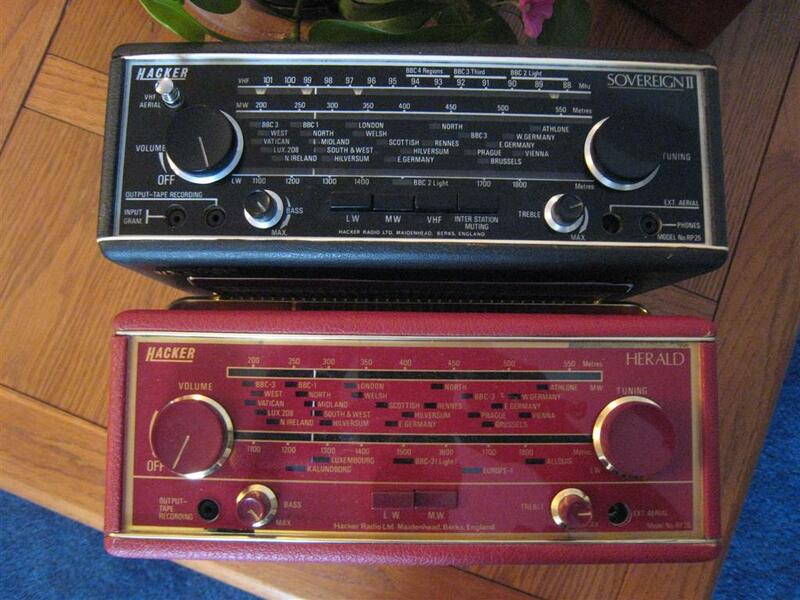 Still…they were popular radios and for casual use lots of fun. 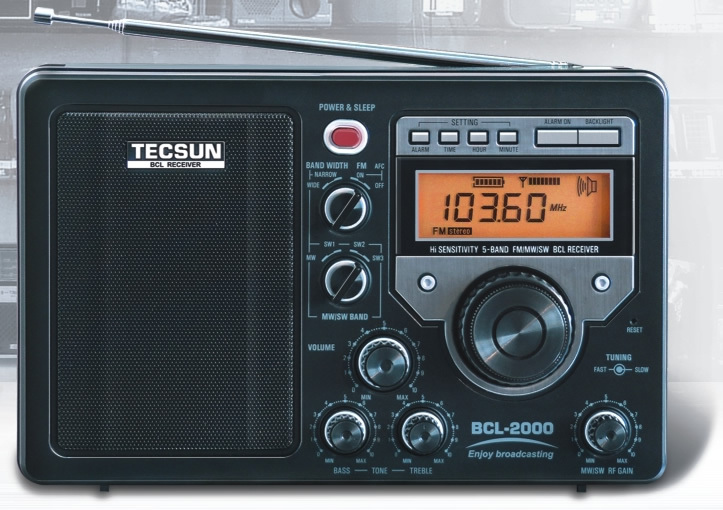 Tecsun (the OEM manufacturer of all of these radios) added a Tuning Lock feature and rebadged it as the BCL 3000…this was added to later production S350’s as well. That feature was pesky…it fought you as you tried to fine tune, although once tuned in it did reduce drift significantly. 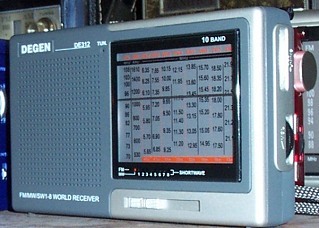 The final version of this radio was the S350DL (Deluxe) which is rated above for slightly superior AM reception and sound. 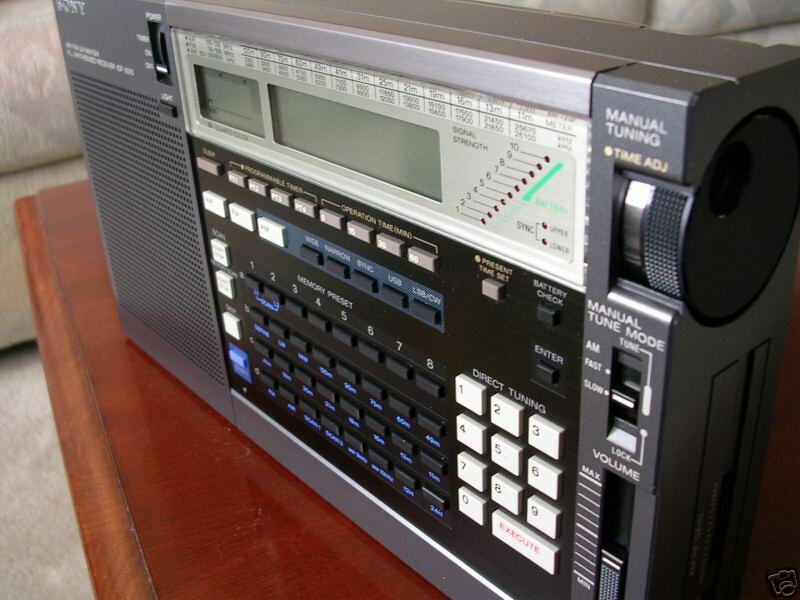 ** Grundig Satellit 750/Tecsun S-2000 – Good desktop replacement and also runs on batteries. This radio is almost irresistibly cute and it is fun to use. It also has very sensitive SW and good FM reception but AM performance is only two stars with its built-in antenna. The rotating AM antenna is a big plus but many samples have noisy contacts, although they can be cleaned if you care to venture inside. Great flexibility with external antennas puts it above most contemporary portables in that regard. Consider the Narrow Bandwidth setting to be Normal on FM where the Wide setting is too wide to allow decent selectivity. Read The Grundig Satellite 750 Review See it at Amazon. 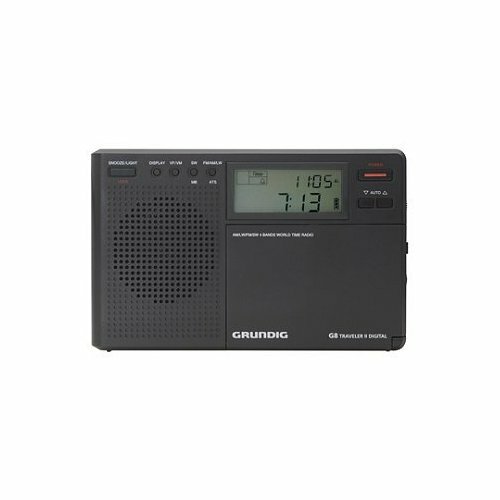 ** Eton/Grundig Field S450DLX – The S450DLX offers several improvements over the older S350 series but is less desirable in some ways too. The biggest improvement is in SW. Unlike the S350, the S450DLX is PLL Tuned and Dual Conversion making it far more stable (no drift) and no need for the annoying Tuning Lock feature of the older models. Also, because the new model is Dual Conversion, there are none of the false images so prevalent on the 350. Overall SW reception on the new model was at least as good as on the older one, perhaps a bit better. On AM (MW) however it is a different story. The S450DLX fell prey to annoying spurious tones and noises across the AM band caused by poor implementation of DSP (Digital Signal Processing) , affecting reception of even some fairly strong local signals. I don’t know about you but I don’t like hearing a steady tone over my local AM stations and the S450DLX is as bad in this respect as any I’ve heard. Horrible. 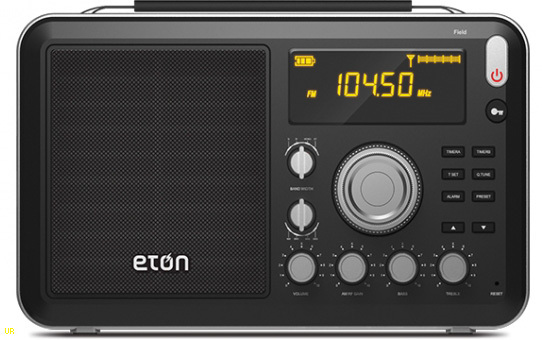 Eton should be embarrassed to allow such an otherwise nice radio to be marketed with what I deem to be a crippled AM section. No AM radio lover will like this. FM was not bad but reception was better when I off-tuned a bit indicating poor alignment. Sound is OK but not as good as it should be in a radio this size. Overall a disappointment…everything is much improved on the newer Field 550. Read The review. See it at Amazon. **Eton/Grundig Satellit – The latest in a long line of prestigious radios, the new Satellit has no model number to distinguish is from all the previous Satellits which were numbered. While this newest Satellit can hardly compare with the older, more expensive and sophisticated radios, it nevertheless performed admirably compared with the other portables in its same size and price class. It outperformed the Tecsun PL-880, PL-680 and PL-660, Sangean ATS-909X and the Sony 7600GR on virtually every AM signal, sometimes by a hair, sometimes by a wide margin, with a lower noise floor and stronger apparent reception. Only the Eton E5/G5 outperformed the Satellit on a few signals by just a hair but they were very, very close, and would be hard to distinguish under most conditions. In this size class radio the Satellit is as good as it gets for AM reception in a current production model. SW is as good as the competing current day models from Tecsun and Sangean, and FM is superb as well. One of my favorites for travel. Read The Full Review. See it on Amazon. 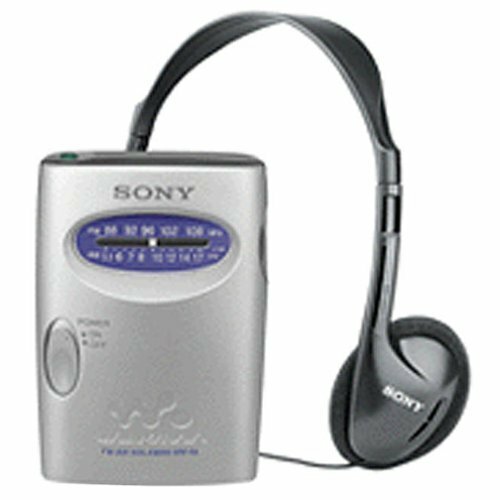 **Sony ICF-SW 7600GR – The last of the quality Sony multi-band portables, the 7600GR (and its similarly-performing predecessor the 7600G) were for years the standard-bearer in this segment as the only sub $200 radios to offer synchronous detection. They have now been joined by several models from Degen, Tecsun, and Grundig but most of those sync circuits are not worth using…the sole exception being the Tecsun PL-660 and PL-680 which have decent sync. The Sony shows a level of quality and unit-to-unit consistency sadly lacking on most of the current radios from China…the only weaknesses in the 7600GR seem to involve noisy volume controls and a rod antenna mount that can break if you are not careful. Performance is adequate but not exceptional…AM sensitivity is good but weak stations are a bit noisier than on the radios above on the list. The synchronous detection can sometimes improve a signal dramatically. 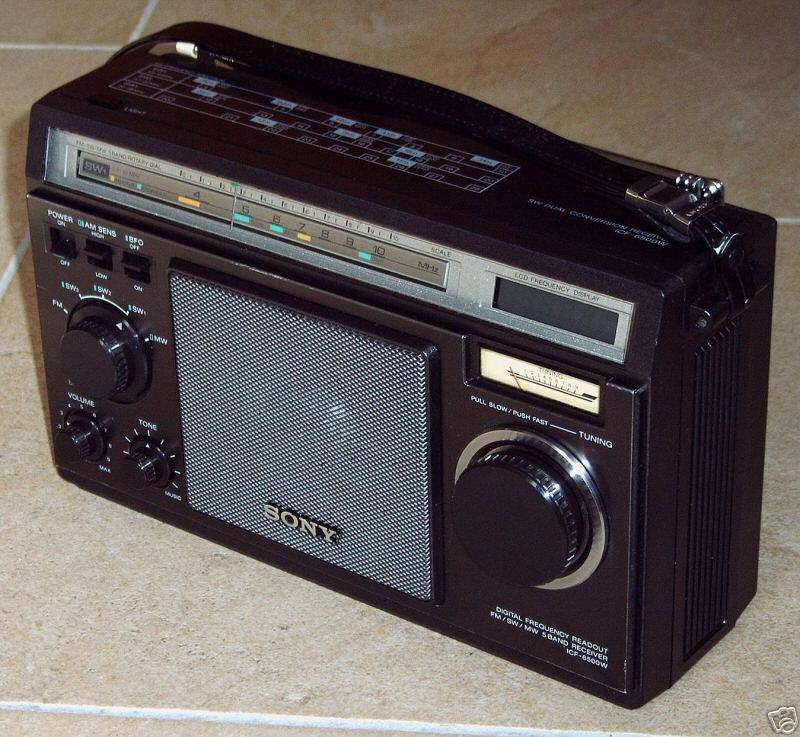 The Sony’s sound is midrangy with no top end extension which makes it sound sometimes honky yet still muffled and it lacks a tuning knob…tuning is via Up/Down buttons only which to many people is a negative…it’s not a fun radio to band scan with. FM reception is average…far below that of current DSP radios whose FM performance runs rings around it. 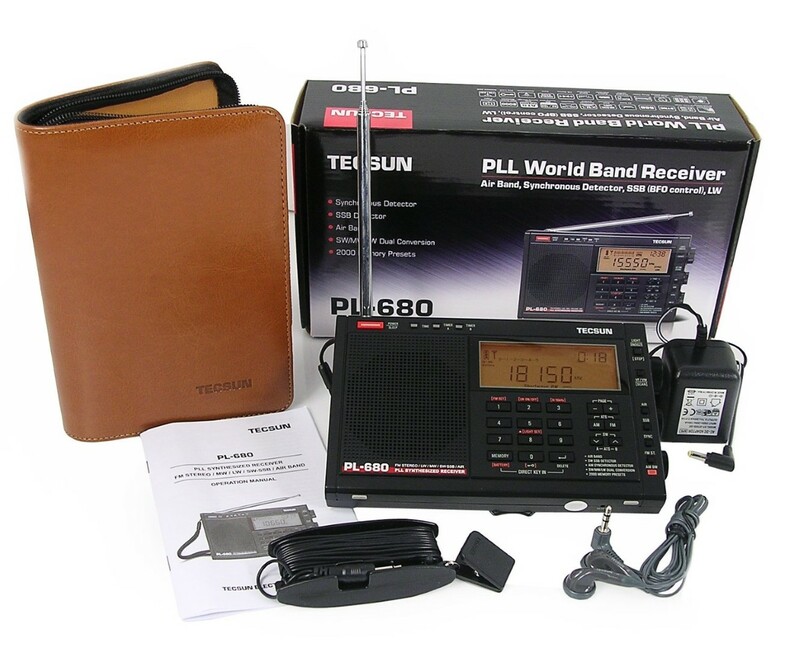 **Tecsun PL-880 – The feature-rich PL-880 is very attractive, feels very solid and has an amazing number of features, many of which are “hidden” – that is, they are not referred to in the Tecsun/Kaito owner’s manuals and there are no specific keys labeled with most of them. For example, Synchronous Detection is present but accessed via the SSB keys. The Yahoo PL-880 Group is an excellent resource for info and my full review lists the hidden features for quick access. 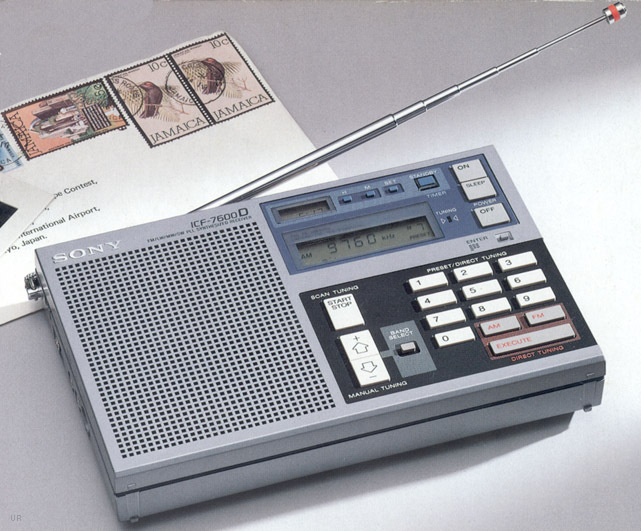 The PL-880 is also unusual in that it runs on a single 18650 Lithium Ion cell which recharges in the radio. The radio has a smart charger which will not over charge the battery, and the radio tells you when charging is complete. 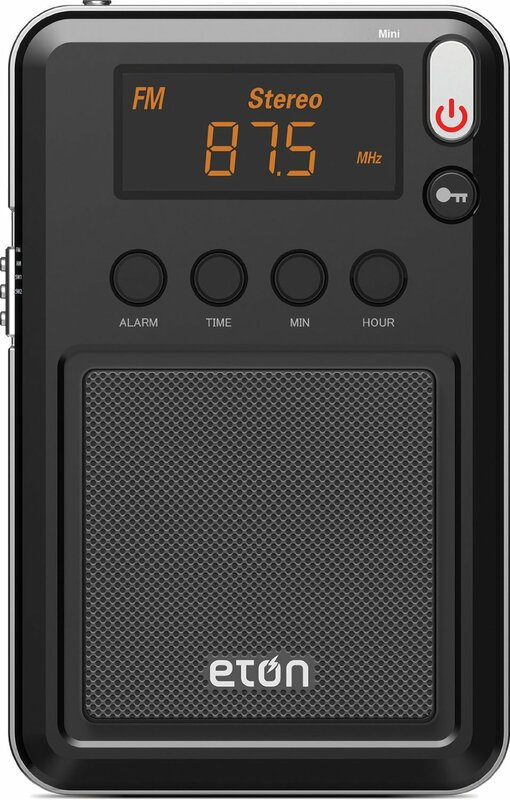 Finally…a smart charger built into a radio! A USB charger and USB cable were included with my radio but it uses a standard USB mini-plug so the radio can be charged from the supplied AC adapter, any standard USB adapter or a computer. While it’s Synchronous Detection is so bad as to be virtually useless, I think the PL-880 is a great performer overall. It sounds nice for its size with a high tech speaker design and also features excellent FM reception. AM is OK but as with all current Tecsuns its high noise floor on AM makeverys it less desirable when listening to weaker signals. 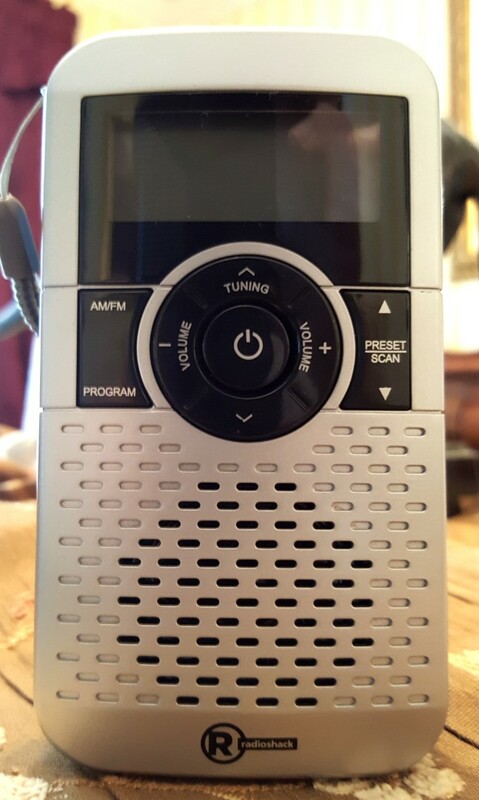 But overall it is a very nice radio.
. Read The Full Review. See it on Amazon. ** Tecsun PL-660 – Overall the PL-660 is a solid performer with reception quite similar to its upscale brand mate PL-880 above. It’s well-made and feels solid, and although it doesn’t sound as sweet as the PL-880, the ‘660 does have a good Synchronous Detection circuit which can be a big help with some problem signals. Its AM performance is a bit puzzling though. It has decent AM sensitivity because it pulls in very weak AM signals as well as the radios above, but as signal strength improves the hiss does not drop down nearly as fast as it should, meaning that many medium strength signals sound hissy compared with higher rated radios. Often using a small passive loop doesn’t bring much improvement because the signal has to get a good deal stronger before that hiss goes down…in other words, the radio is fairly sensitive but has a poor quieting curve. Too bad since it is so good in other areas and it also does a decent job handling an external antenna if you use the DX/Local switch. Read The Full Review: See it on Amazon. 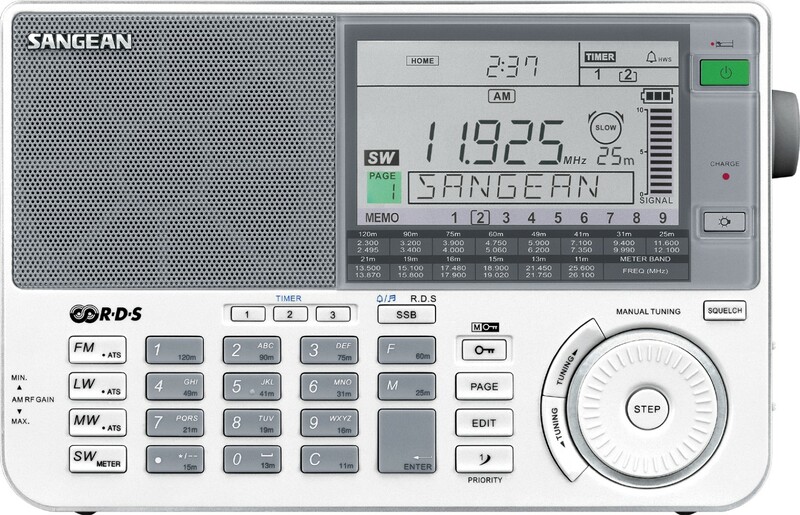 **Sangean ATS-909X – By rights this radio should score higher and on an overall basis it would, but its AM and SW stand-alone reception is fairly insensitive. Medium strength signals which are free-enough of noise to be pleasant to listen to on the radios higher on this list have a strong hiss component on the 909 similar to the PL-660 which makes them hard to enjoy. The ATS-909x is overall a much improved radio over the original 909 with much better sound quality and features but on both AM and SW it really needs an external antenna to be competitive. In fact, with an external antenna it would rank as at least a three star radio. FM reception is excellent on the whip antenna although the sound is a bit bright (trebly) on FM. 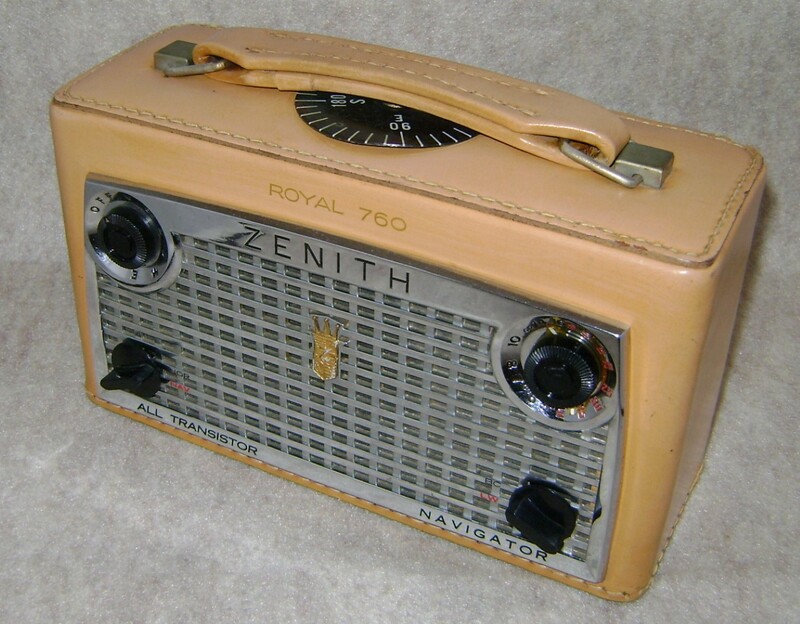 **Zenith Royal 500D/500E – The Royal 500D and 500E were improved versions of the earlier Royal 500 series and are the predecessors of the Royal 500H above and are only a stone’s throw beneath the “H” in performance. 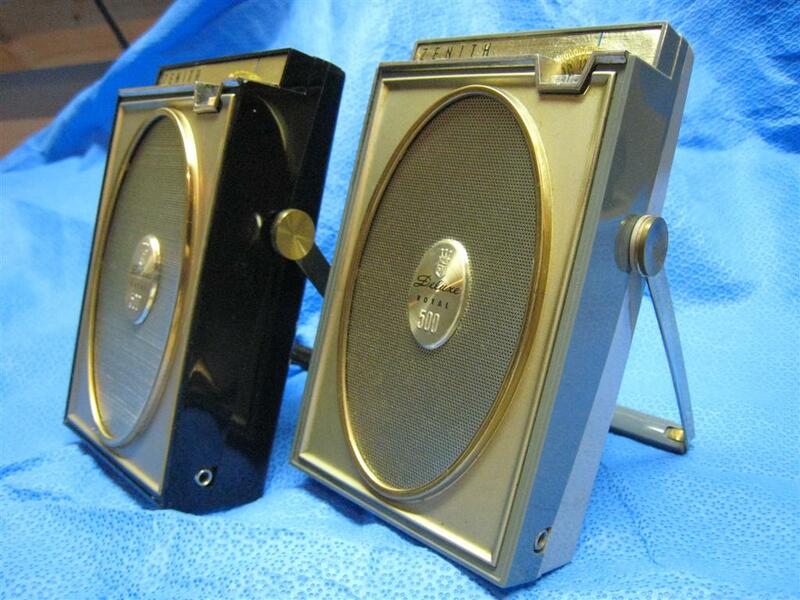 The “D” was considered the first of the high performance 500 series radios…these are the last 2 models of the so-called “owl eye” series that helped make Zenith a name to reckon with as a leader in pocket transistor radios. Nowadays we would consider these a bit larger than pocket size…I guess you could say coat pocket size. They lack the advanced off-center driven speaker of the Royal 500H and Royal 400 but are almost as sensitive and selective and will trounce any of a number of cheaper current day radios further down on this list. **Eton/Grundig Traveler III – The Traveler III replaces Grundig’s popular G8/Traveler II (aka Tecsun PL300WT). 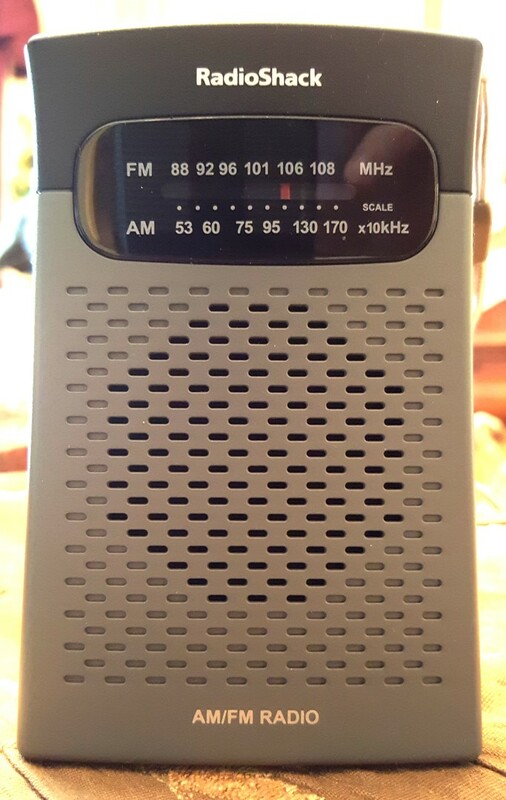 The original model was an instant hit and became an Ultralight favorite…the new Traveler III is a much better AM radio than the earlier model but FM and to some extent SW seem to be just a slight step backwards which is odd. But as an AM lover I am impressed by this new radio and think you will be too. In fact in my complete review I said it was, “a breakthrough in AM performance at this size/price level. The result is far better listenability on weak and fading signals.” It is also free of DSP-induced Digititus and soft-muting annoyances…this is just a great little, relatively inexpensive radio for AM lovers. **Roberts R-250 Revival – (C. Crane US Import Version) – Sadly discontinued the R-250 was initially offered in genuine leather and later in vinyl. This is an eye-catching reproduction radio, styled after Roberts (of Great Britain) first transistorized model, the 1958 RT-1. 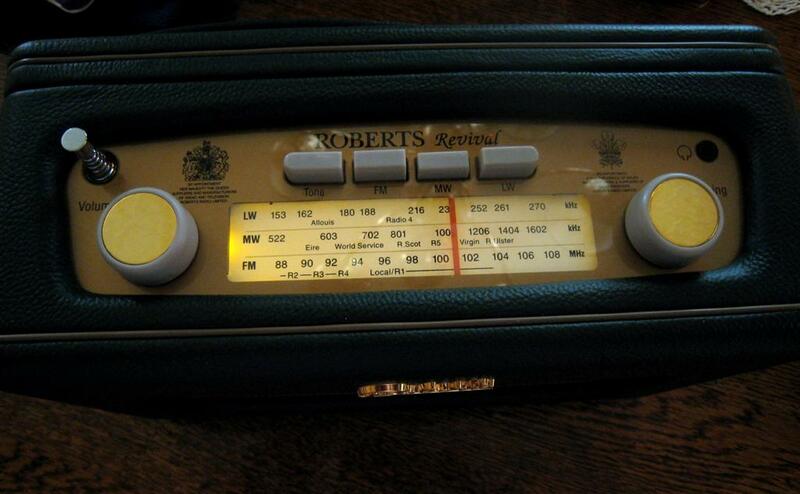 The Roberts is a charming radio with a Euro-style, full-time lighted analog dial and simple design. Sensitivity is good even if not the best but selectivity is razor sharp so it can deal with European, closely-spaced signals. Beautiful to look at and a joy to own , this is definitely a radio for the nostalgia buff but its performance is good enough that it does not have to make any apologies for also being a cutie. Somewhat muted tonal quality compared with most other radios is a drawback but still it is pleasant enough to enjoy. **Tecsun CR-1100 – The digital DSP-based Tecsun CR-1100 offers good value for the price if your expectations are reasonable. It is at least as sensitive on AM as the other ** radios although it is marred in some conditions by soft muting which causes pumping or surging in the audio at certain signal levels. Usually this can be controlled by slightly re-aiming the radio and it is less of a problem at night than in the day time but at this state of the art this soft muting should be dropped by the manufacturers. Overall good sound in this category and reasonable if not top shelf FM performance as well. 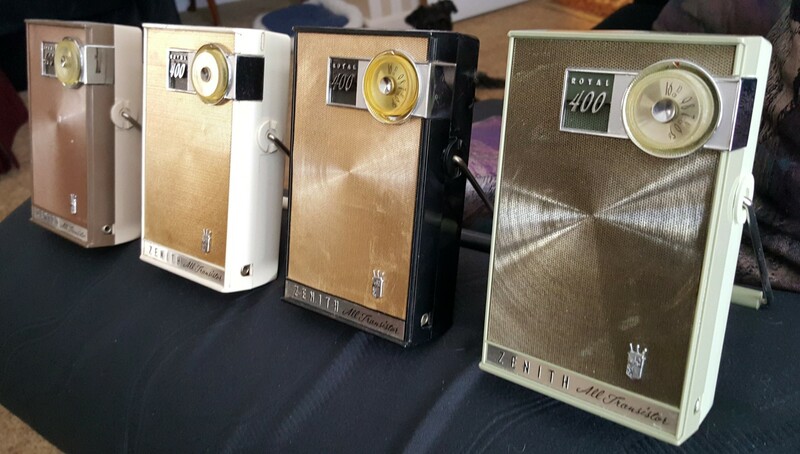 **Zenith Royal 400 – The 7 transistor Royal 400 is a great performer, with sensitive reception almost as good as the well-known 500H. Extremely faint signals are quieter due to less gain to compensate for them but most signals you would actually listen to sound about as good as the 500H. It also has the same extended range, off-center speaker featured in the 500H. Available in 4 colors it is a real looker and is a joy to use and listen to. 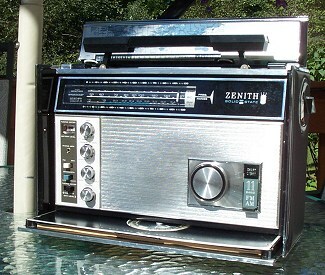 **Zenith Royal 475 – Another less well-known model the Royal 475 features 7 transistors, a three gang air variable tuning condenser, tuned RF stage and 400 milliwatts of audio power. The 475 has a mellow, powerful sound and excellent reception at the top of the two-star group…it has become one of my favorites. *1/2 C. Crane CC-Skywave – The CC-Skywave is aimed at the traveler who wants as many sources of information as possible but it is also useful at home. 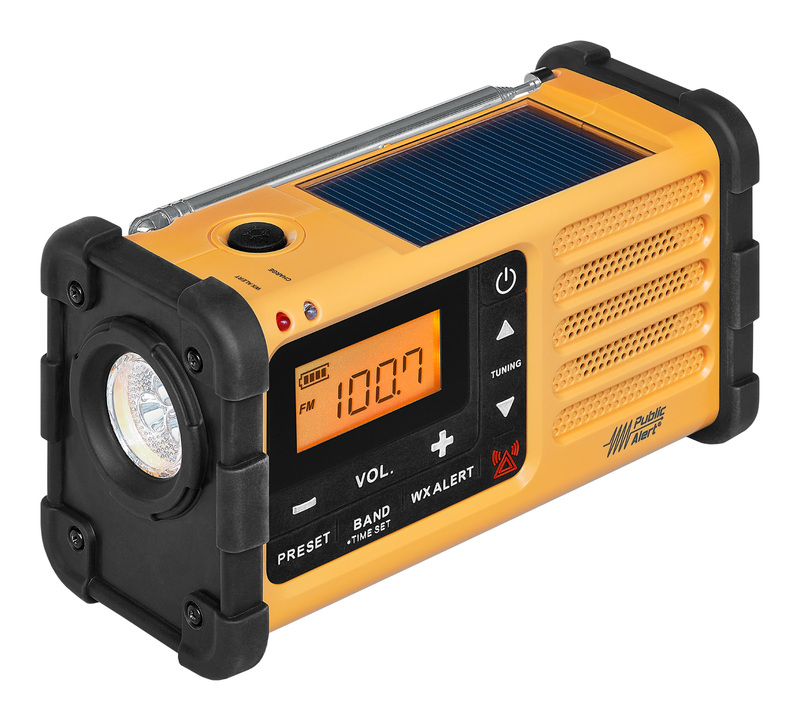 It is unique in a small portable radio in that it tunes not only standard AM/FM broadcasts but also includes Shortwave, Weather Band and Air Band. It actually incorporates two DSP chips to accommodate this unusual band coverage. It’s a fun radio, easy to master and offers AM reception a tad better than the PL-310 below primarily due to its relative lack of DSP interference and soft muting problems. As a DSP-based design it also offers multiple AM bandwidths which is what hard-core DXers need…for program listening I find that reducing the bandwidth also helps tame the very crisp audio so actually you have lots of control over the final audio. A versatile and fun package! UPDATE: I have evaluated a prototype of an updated version which will be essentially the same design but will add SSB reception. When the new model is finalized and available I will update the review. 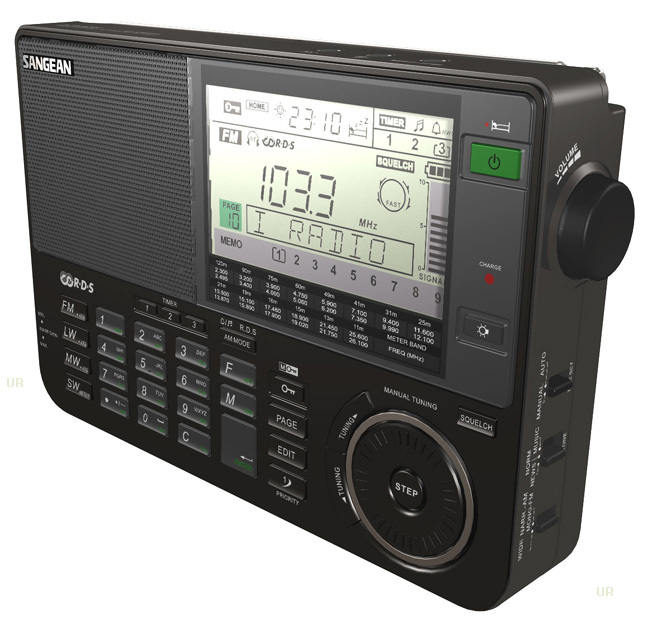 *1/2 Sangean MMR-88 – A DSP Emergency radio with decent performance…best in the small-sized crank radio class. Charges by crank, solar power, or by plugging into any USB source. Will also charge your cell phone and it provides a flashlight in addition to AM/FM/NOAA Weather Band. Very good performance in its category and CUTE! 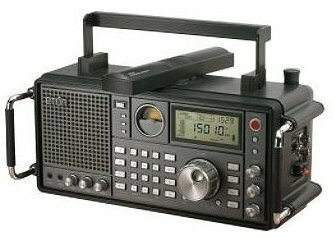 *1/2 Tecsun PL-365/CountyComm GP-5/SSB (After-Market 8″ Ferrite Rod Raises AM Rating To **) – The PL-365/GP-5/SSB is an unusual radio designed for single hand held use and primarily targeted at SW/SSB users. However, even with its relative small plug-in ferrite antenna it actually outperformed the larger PL-680 on AM with slightly better sensitivity and less background hiss on weaker signals. 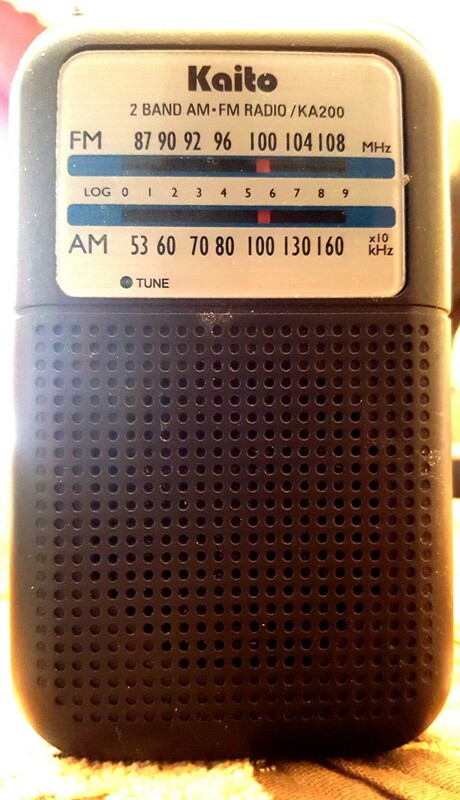 It was only a hair less sensitive than the PL-660 and PL-880 on AM which for this size radio is great performance. You can also obtain an after-market 8” ferrite rod antenna which in many cases significantly improves AM reception. FM performance is very good but not spectacular…I rated selectivity as excellent but sensitivity only Good – the regular Tecsun PL-660, 680 and 880 outperform the PL-365 on FM. Tiny speaker is designed for voice intelligibility. 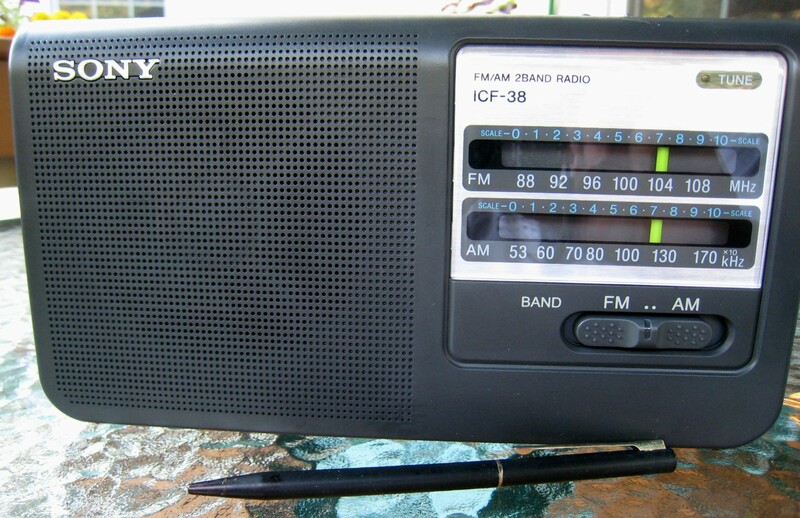 *1/2 Sony ICF-38 – The Sony is plain and simple but hard to fault in any area….it’s a great travel radio and won’t break the bank if lost or broken and it is very simple to use…no learning curve! While no powerhouse performer it is fine for pulling in your local AM and FM stations with decent reception of even medium strength signals. It also features a built-in AC cord so is a good choice for all-day listening. 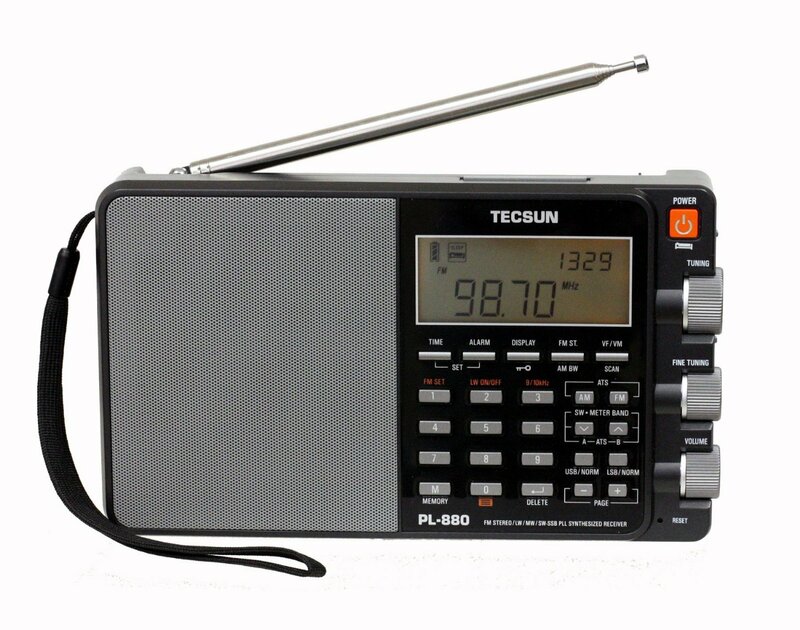 *1/2 Tecsun PL-680 – I was disappointed that the PL-680’s AM is less sensitive than the PL-660 which means medium to weak stations are received with more circuit hiss…if a station is weak and/or far away, it sounds weaker or further away on the PL-680. AM is not the strong point of Tecsun’s current line-up which all perform far better on FM and SW. I have to rate the PL-680’s AM as mediocre to fair at best – both the PL-660 and PL-880 outperform it on AM. The PL-680 is one of the better FM portables available today however with excellent FM sensitivity and selectivity…it’s SW is also very good and on a par with the PL-660 and PL-880. It also has improved audio over the PL-660 but not as good as the great sound of the PL-880. It would rate as a solid ** or better on SW and among the best on FM. 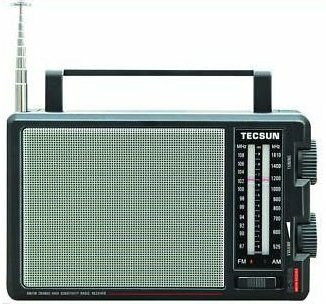 *1/2 Tecsun R-308 – The Tecsun R-308 is a handsome, classic-style analog AM/FM portable with a vertical slide rule dial. 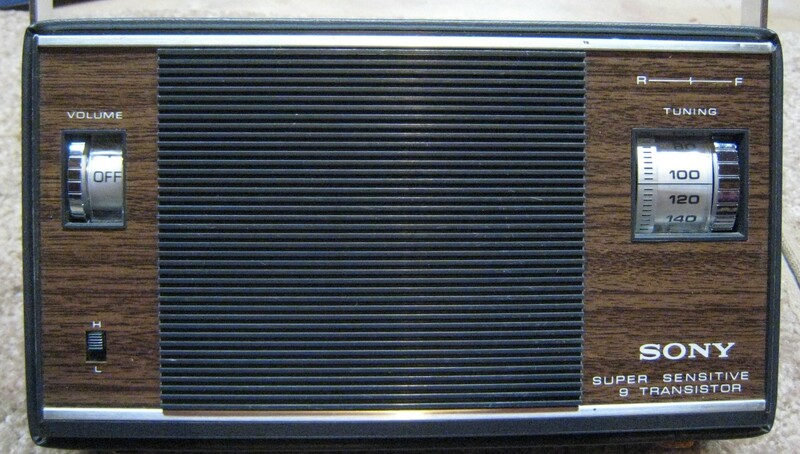 It is advertised as a “big speaker” radio and indeed its grille emphasizes the amount of space the speaker occupies in the radio…actually the speaker is 4″ so it’s not quite as large as the grill might lead you to believe…still, 4″ is a respectable size in today’s market and at this price. Pricing for some reason is all over the place on the R-308 ranging from $35-$70…it is a good deal near the bottom of that range. The radio feels heavy and solid…not cheap and flimsy like so many current products. The sound is pleasant although not spectacular. AM and FM reception are good for this price range…it is reasonably sensitive and selective on both bands. *1/2 Zenith Royal 450 – The 450 is a good performing 7 transistor model with good sound, Vernier tuning and decent RF pulling power. The orange version is hard to find and is considered a prize by collectors. *Tecsun PL-398MP3/PL-398BT – The PL-398MP3 tunes AM/FM/LW and provides FM stereo through its dual 2.5″ speakers. It also plays digital music files via its SD card reader. The BT version adds Bluetooth connectivity for playing music from any Bluetooth enabled device. The PL-398 series has excellent FM reception characteristics due to its DSP chip design…its AM reception is typical in this group, which is to say it’s fine for general reception of typically receivable signals. Another cute little box but don’t expect to hear much stereo separation unless you are very close to it. *Tecsun PL-310 – An established favorite among the Ultralight group the PL-310 has some stellar qualities, such as multiple bandwidths for great selectivity, and a nice overall feature set. 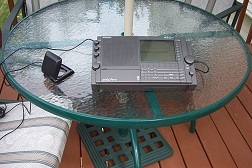 Used with external antennas the PL-310 can really help sort out a crowded dial, but for the program listener, as opposed to the hard-core DXer, its stand-alone AM reception is rather noisy and it does have some spurious digital noises on the AM band, along with some pumping of the audio due to soft-muting. 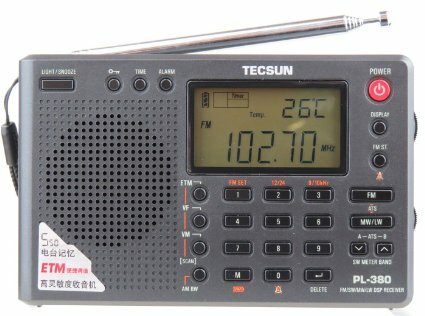 *Tecsun PL-380 – The PL-380 is a close cousin to the PL-310. It features slightly less sensitive AM reception but has the advantage of less soft-muting which means it may be more enjoyable for the average user with less pumping in the audio as signal strengths vary. 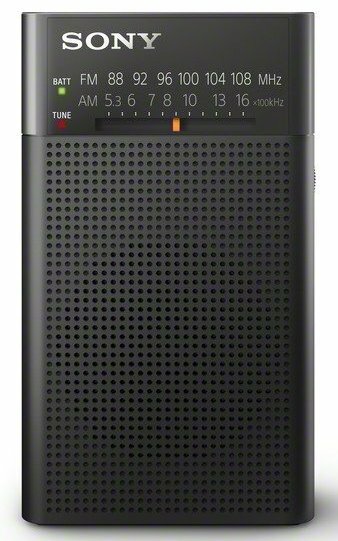 *Sangean DT-160 – Although AM reception is typical for pocket radios the FM is a standout performer, competing with the CC-Pocket. FM as good as it gets in this kind of radio and a Bass Boost mode helps some earbuds to sound fuller. Read The Full Review. See it at Amazon. 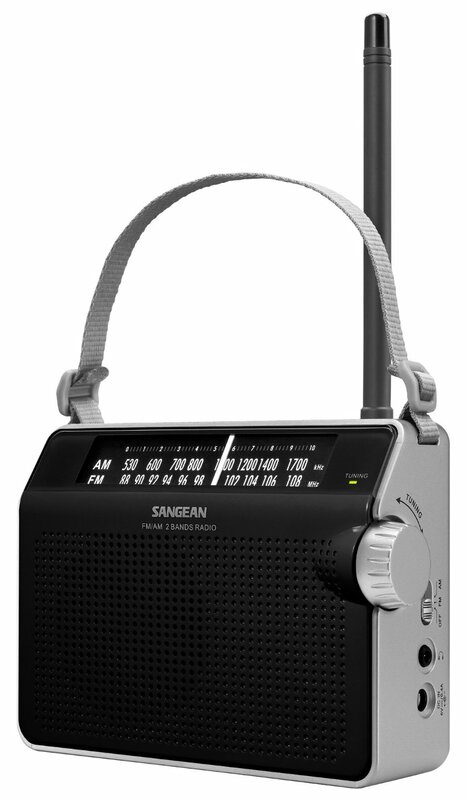 *Sangean DT-200V/VX – Predecessor to the DT-400W above but in black, this earlier version has the now defunct VHF TV channels 2-13 rather than the weather band. It also sounds a bit thinner and does not receive stations quite as well as the 400. The original DT-200VX has been replaced with the DT-200X which eliminates the defunct TV Band Channels 2-13…this version has not been tested. *CC Pocket – The CC Pocket competes head to head with the Sangean DT-400W and DT-160 above. It’s a Walkman-style radio which means it is primarily designed to be used with earbuds…a pair of CC earbuds is included. 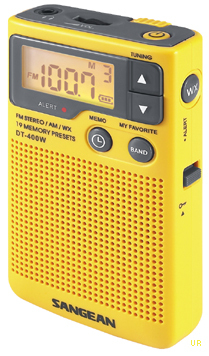 However there is also a built-in speaker for utility use (again like the DT-400W) – this is particularly useful if you use the radio for NOAA Weather Alerts. The CC Pocket is a great overall performer and on an absolute basis would rate higher than the DT-400W because of its absolutely superb FM tuner which as I wrote “trounces” the DT-400W on FM . On AM it also has superior selectivity but somewhat less apparent sensitivity so weaker signals are heard with a bit more circuit hiss underlying them. *Sangean SG-622 – A real sleeper, the old-school SG-622 has been around for several years and is so unassuming and inexpensive that most people ignore it. It predates DSP chip design and is all analog. It happens though to be a rather nice, inexpensive radio with nice sound and decent AM reception that also includes SW and FM. 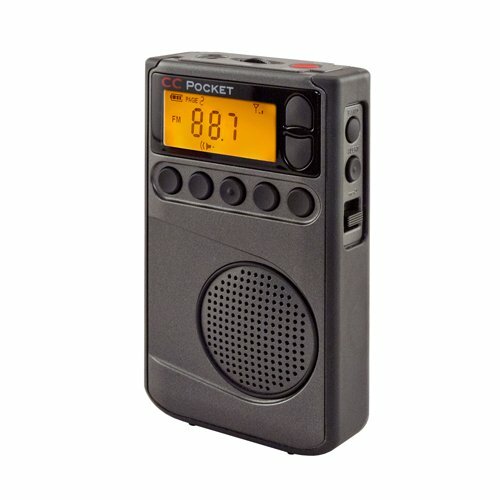 Not quite as small as the Ultralights it is still small enough to be a convenient travel radio but it’s also a great little set to catch a ball game with wherever you happen to be, and it’s so inexpensive…. 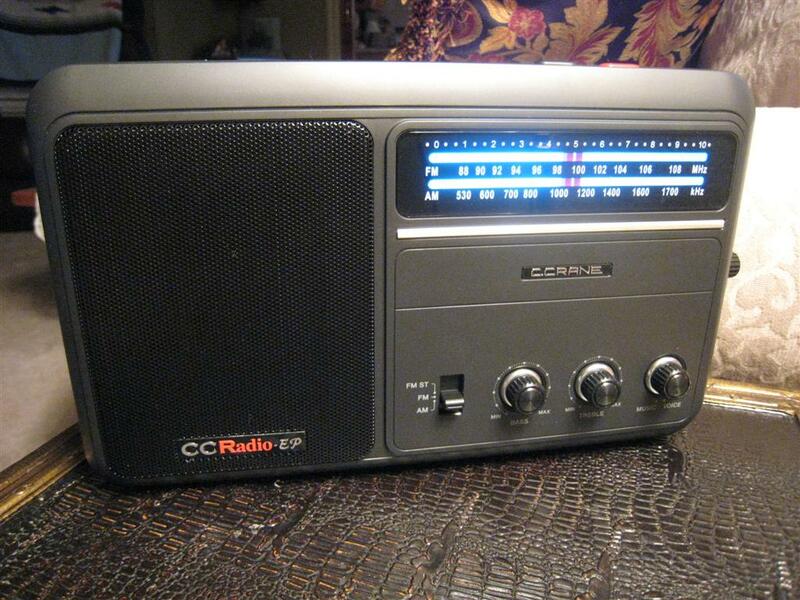 A great value…it also features nicer audio than any of the one star radios above. *Tecsun PL-210/PL-200/Eton 100 – I grouped these together because they are quite similar on AM but they are an interesting study. Available in eye-popping red, the PL-200 and E-100 (in silver only) were a traditional PLL design available for several years and later replaced by the almost identical-looking PL-210 which, nevertheless represents a total internal DSP-based re-design. The radios are very different in many ways…the 210 is much improved on FM and SW and it’s software is more friendly and quicker to boot up at turn on, and even though the AM’s have slightly different characteristics they seem comparable overall. 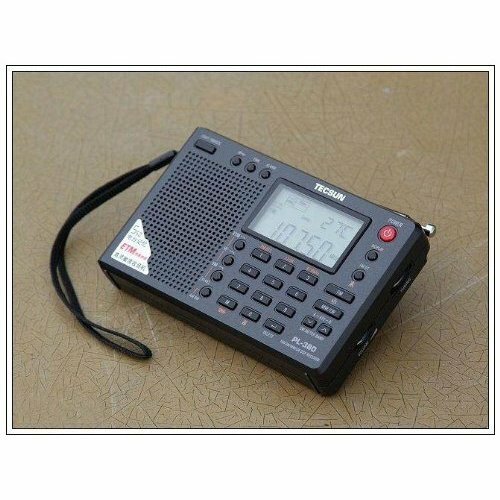 *C. Crane CC Radio-SWP/Redsun RP300 – The CC Radio-SWP (Shortwave Pocket) and essentially identical Redsun RP-300 perform similarly to the radios immediately above which is fine for a small travel radio. One complaint from some owners is that it seems to have big volume increments at the low end of its volume control…one notch goes from quiet to noticeably louder…this might be a problem for those who like to listen at very low volume. However the SWP has good ergonomics and makes a fine travel companion if you don’t wish to spring a bit more money for the more capable CC Skywave. *Panasonic RF-2400 – The Panasonic RF-2400 is a basic mid-size AM/FM portable radio with a pleasing retro look and a large slide rule tuning dial. At a street price generally below $31 it offers good utility where maximum performance is not needed nor expected. It has a built-in AC power supply so it can operate for long hours without draining its batteries. However, being a totally analog design, it sips power from its batteries and will give many hours from a set of 4 AA alkaline batteries. 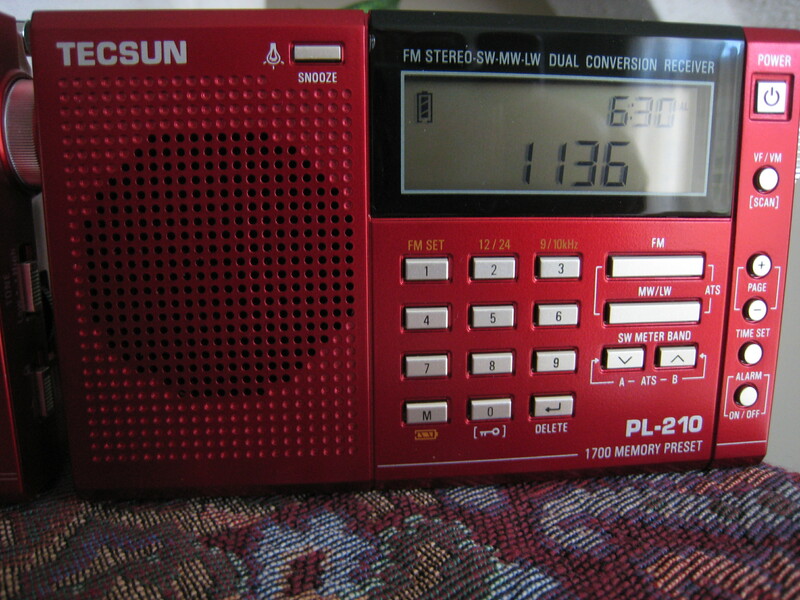 *Tecsun PL-606 – The Tecsun PL-606 is comparable overall to the RP300/CCRadio SWP above on AM. Oddly it has a very short rod antenna (for FM and SW) but comes with an extension rod…the rod seemed to help the FM more than the SW which was a bit of a surprise. *Grundig G-8 Traveler II/Tecsun PL-300WT – The G-8/PL300WT is noted for excellent FM reception, but its AM has some DSP artifacts…spurious tones and noises as well as soft-muting which reduces the volume if you off-tune slightly which can be annoying. Note the replacement Eton/Grundig Traveler III is much improved on AM and is in the **Two Star listings above. 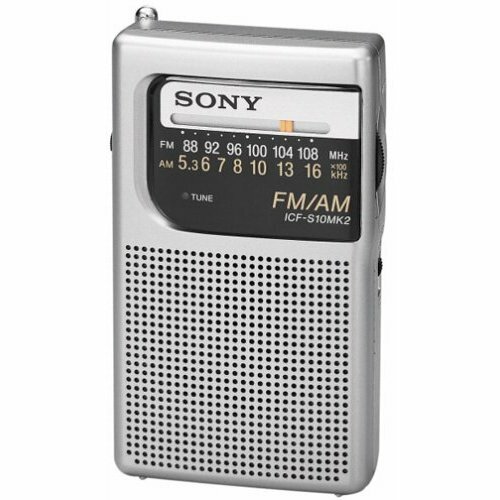 * Sony SRF-59 – Another favorite of the Ultralighters, the SRF-59 is or was available in a clear prison version and was one of the radios that helped spark the Ultralight craze. It is so inexpensive people could modify it without fear of damaging it. A Walkman style AM/FM radio the SRF-59 sounds mellow in earbuds and delivers decent AM reception on a tight budget. No digital features, no hets…no DSP noises…and a decided notch above the radios below. My two samples were pretty much the same but these are said to vary sample to sample. Pocket Portables – Most of these are still available new and are in current production – see links below. Finally, here are some questions I receive frequently. “What about those upscale table radios from Tivoli, Bose, Cambridge Soundworks etc…how come you never rate those?” The short answer is that while I have nothing against those radios, they are not primarily designed for super AM reception. They’re designed for FM sound quality and style first and the AM is very ordinary and sometimes even poor on them. Plus the fact that they don’t have battery capability means they are tied to the AC line which usually increases background noise on AM making reception more difficult. I think they are fine for people who are primarily interested in FM. “What about those rugged work site radios? Can you recommend one of those?” Sangean makes several of these and some tool manufacturers offer them as well…the ones I have seen are credible performers although they of course vary model to model. The primary design objective of these is mechanical ruggedness, a degree of moisture resistance and the ability to play loudly for use at work sites indoors and outdoors. As such they are boomboxes and again, not usually aimed at the serious AM listener or DXer. This may be changing as Sangean has begun to offer some models with updated DSP-based tuners which promise the hope of better reception. One good thing is that you can see many of these in person at the big box stores made by tool makers such as Bosch, Makita, Dewalt, Ridgid and others, but note that some of these require the use of their same-brand battery pack and recharging systems, often sold separately. Here you will pay more money for the ruggedness and coolness factor than for cutting edge AM/FM performance. They definitely have their place as most of our favorite portable radios don’t have the ruggedness or audio power to survive worksite use.